Trip to Adiyogi Shiva Statue (near Coimbatore) – A quick weekend drive! 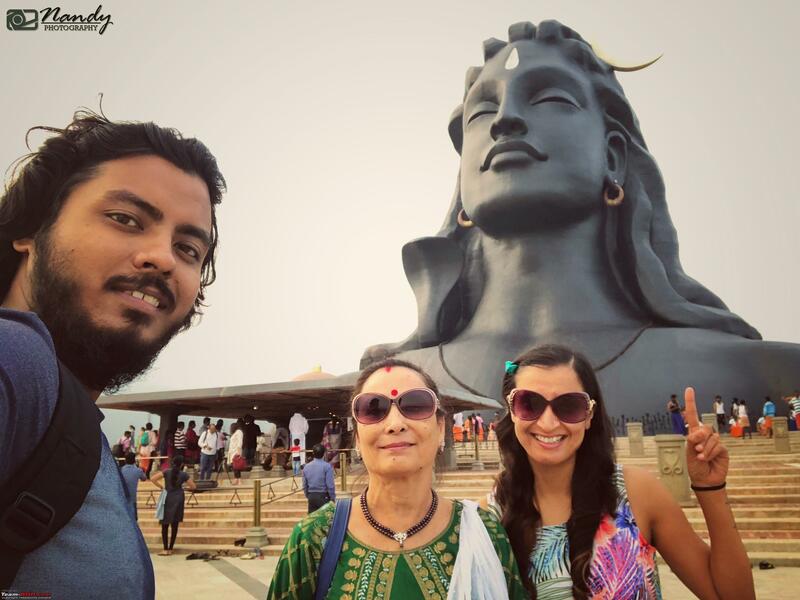 My Mom watches this serial that comes on TV centering around Lord Shiva (I guess it is Devon Ke Dev, Mahadev) and one day when she was watching the serial and a scene came up, I asked her why is Shiva dreaded for his anger when he looks like an epitome of benevolence and divinity. 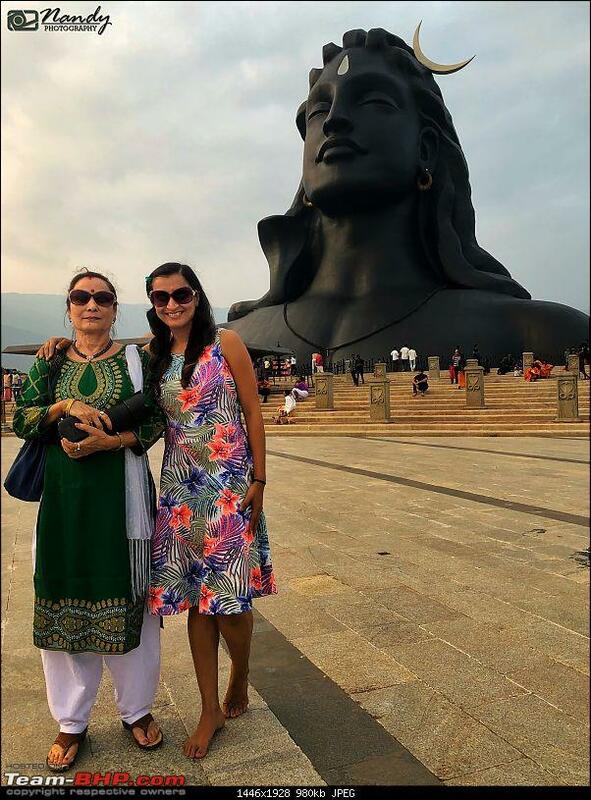 She started telling me numerous stories and other details and like any other person who would go straight to Google for answers, I typed in some keywords for Lord Shiva and times when he is extremely angry. While I was surfing through the net and kept looking for stories, I came across a site which spoke about this beautiful Shiva statue somewhere near Coimbatore constructed last year, known as the ‘Adiyogi Shiva Statue’. The statue was very different from all the Shiva statues I have seen in the past and instantly I felt the urge of seeing it by my own eyes. Spoke with Atul if this trip could be done over a weekend, checked the total distance involved, stay options available and that’s it – the plan was decided. We would be leaving for Guwahati on 5 Dec to drop Mom, so 1 and 2 Dec was the only weekend option left with us. Mom agreed too. Opened the Goibibo app to look for some decent hotel for one night, got a good deal in a service apartment turned hotel. Immediately booked the room and finalized our trip. 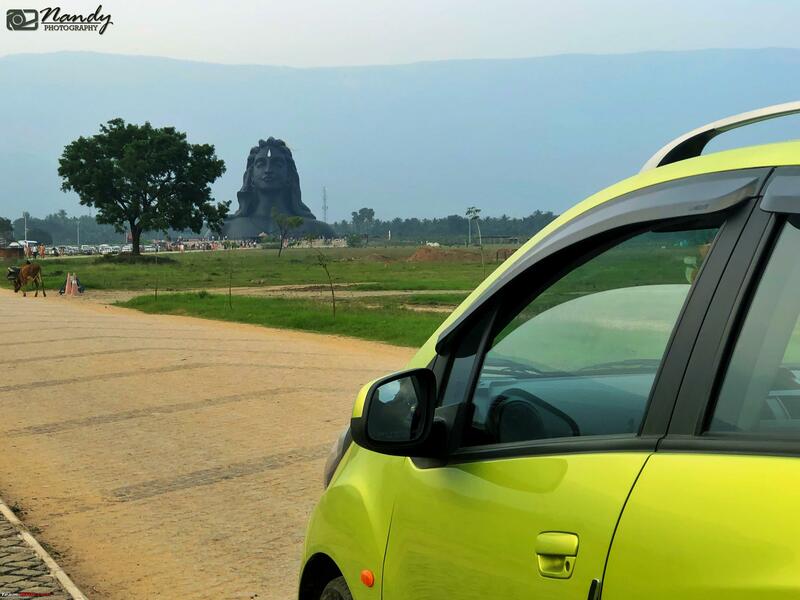 re: Trip to Adiyogi Shiva Statue (near Coimbatore) – A quick weekend drive! Petrol in Skiddy was already half full, so we skipped the ritual of tanking it up the previous night. Packed up all our bags beforehand, as not much preparation needed just for two days. We woke up around 5am in the morning, took shower, and got ready and loaded Skiddy with all the bags. Sharp 6am we started our drive from home. A bit late from our decided plan of leaving by 5:30am, traffic was already getting to start off on the roads. We agreed to take the elevated expressway instead of Hosur road, to avoid unnecessarily getting stuck in the traffic signals. The morning was cool, calm and beautiful with the Sun trying to peep out in between the clouds. 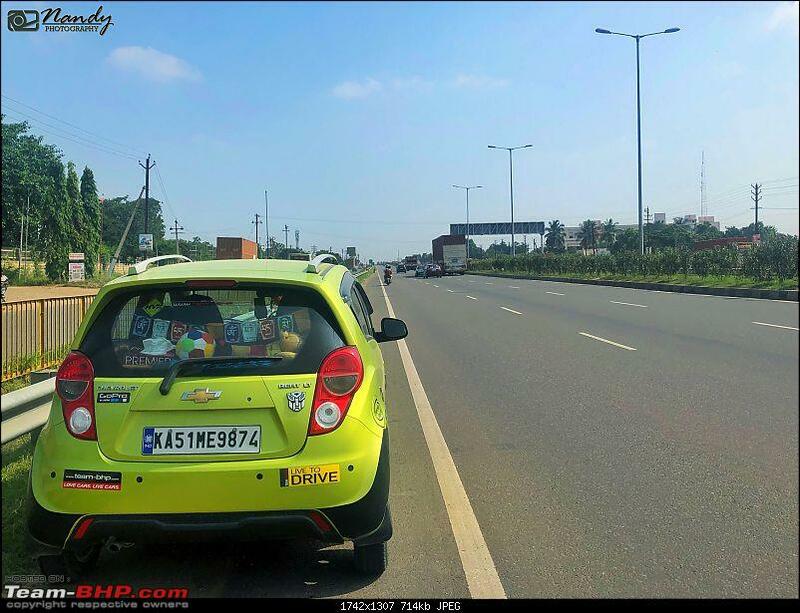 Our initial plan was to reach almost close to Salem toll booth and have our breakfast in the Saravana Bhavan next to the toll. 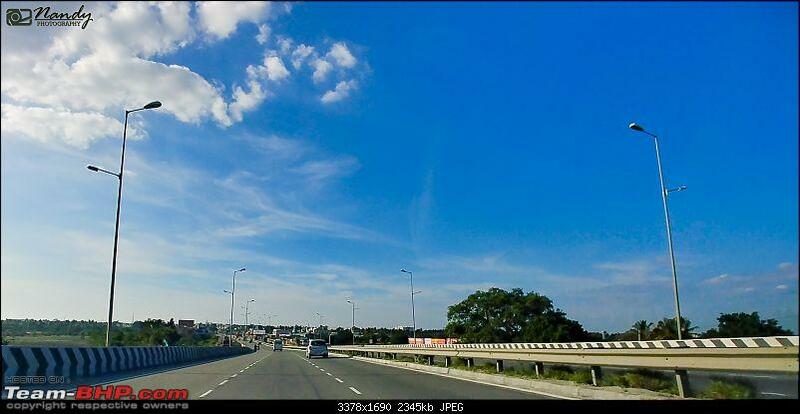 Without much breaks we kept driving, crossed Attibele toll and entered Tamil Nadu state. 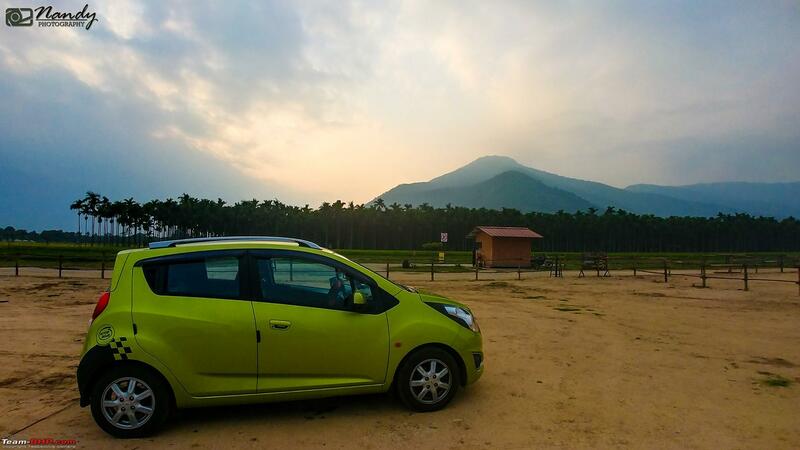 After crossing Krishnagiri toll booth and town, it was my turn to take the wheel as Atul was feeling a bit sleepy. 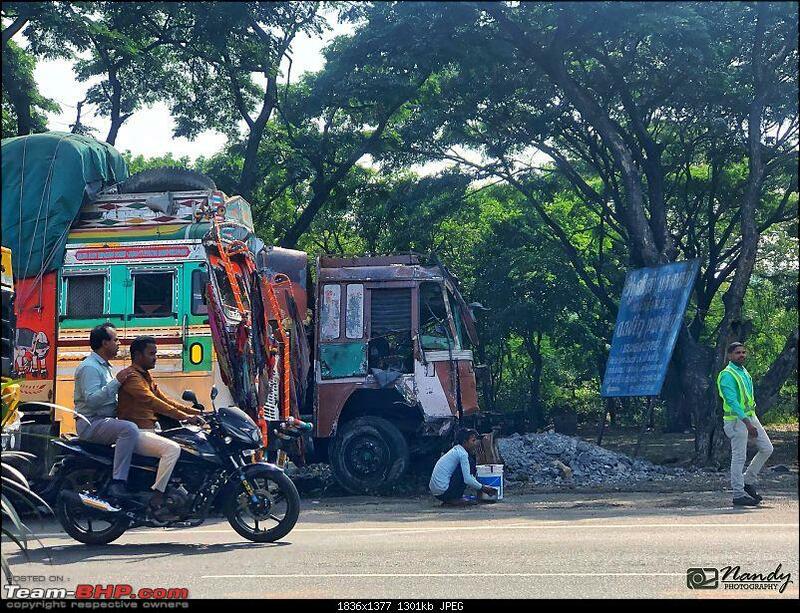 He came to the passenger seat and when he checked his mobile he got to know from one of his fellow Versys group friend that due to some oil leakage on the road, the highway between Thoppur and Dharmapuri is completely jammed packed with vehicles not moving at all, congestion showed some 2-3 hrs delay. 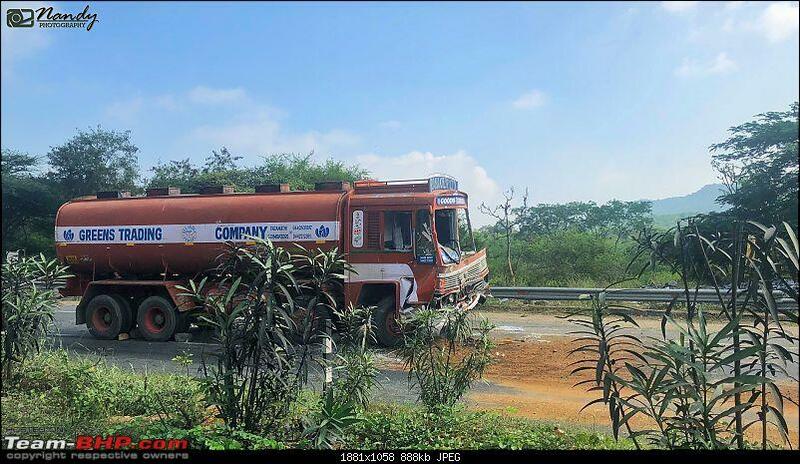 As per the pictures and videos, it looked like a tanker caring some cow fat met with an accident and the entire greasy substance got spilled onto the road, making it difficult for other trucks, cars and two wheelers to ride/drive due to slippery surface. 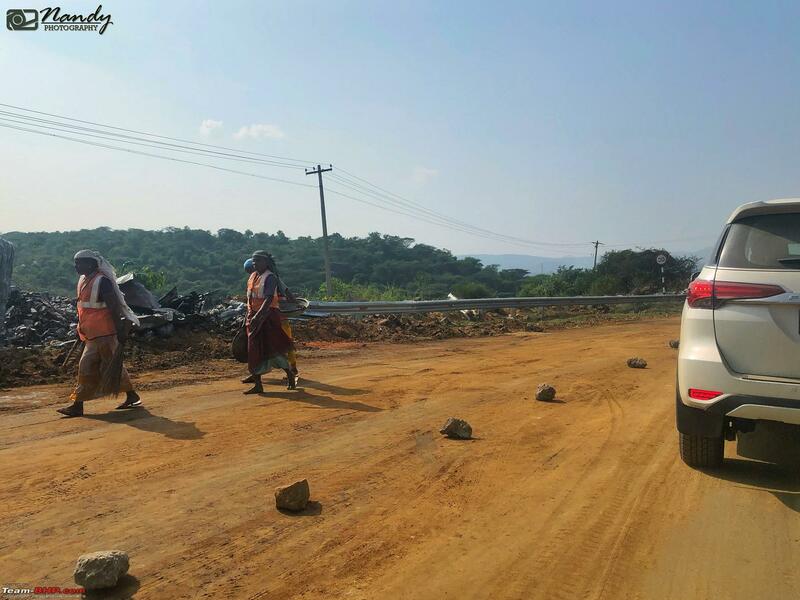 Authorities were trying hard to cover the highway with soil, dust and controlling the situation. With this much information available with us, we decided to take a petrol break and have our breakfast somewhere before so that we can avoid some amount of congestion. 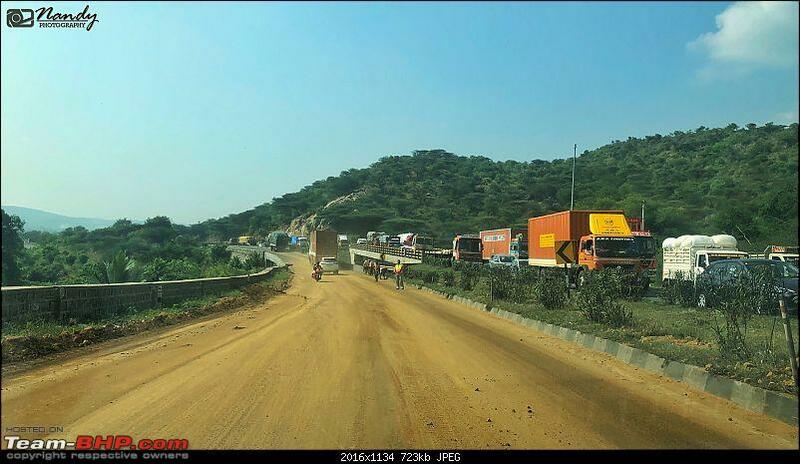 Atul would also look out for some alternate route if the traffic jam could be avoided. We stopped at a BP petrol bunk and tanked up Skiddy at around 8:45am. A few kilometers from here, we came across Saisangeet restaurant near Palayampudur town, it was on the opposite side of the highway but the u turn was just close by. 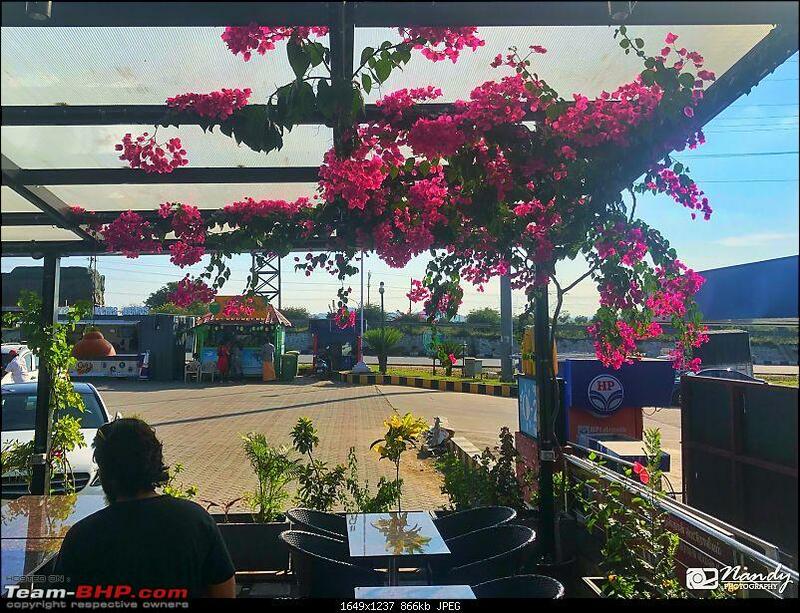 Have been hearing a lot about this place from our friends, fellow riders so Atul and I agreed to stop here for breakfast and kill our time. A petrol bunk attached to the restaurant along with CCD, this place is a chain of authentic South Indian Vegetarian restaurant with legacy of doing food business and hotels. 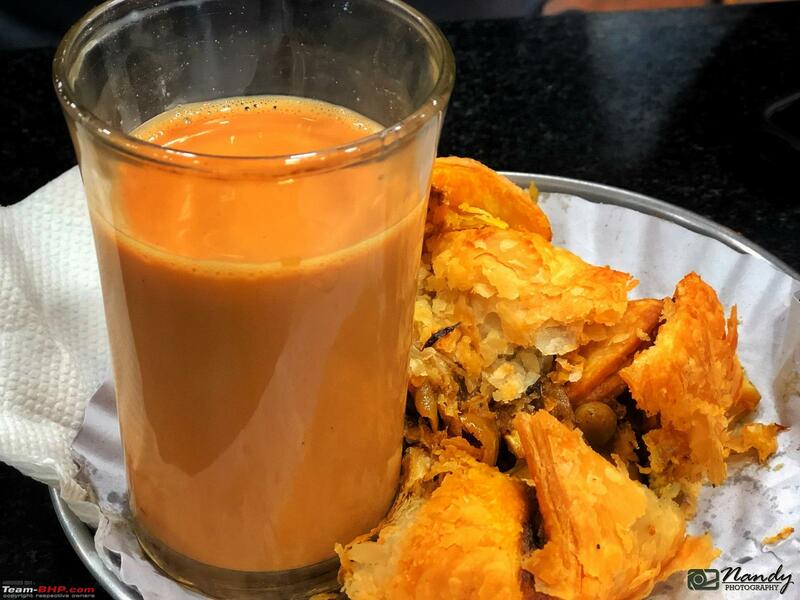 Along with the restaurant, there is a store for buying homemade specialties like village candy, soaps, organic tea, dry fruits, nuts, wooden toys, artifacts, clothing, etc. The only thing we got from here was a box of tissue paper since Skiddy ran out of one, rest of the things looked quite pricy. 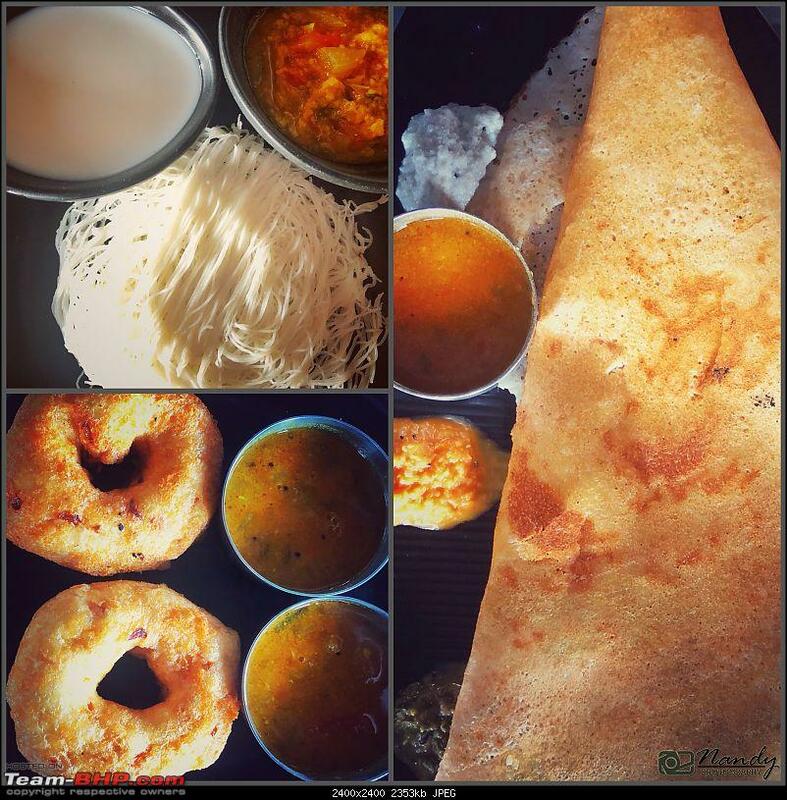 We went up the restaurant, got our table for three and immediately ordered our food, ghee roast masala dosa, podi dosa, vada and sambar, idiyappam and tea. Food was really great and not heavy on the pocket too. The ambiance and serving staff were quite polite too. By 9:15am we decided to take a leave from here and Atul had already found out an alternate route to by-pass some part of the jam and get just another 2-3kms of congestion (which was 14kms away from this spot). 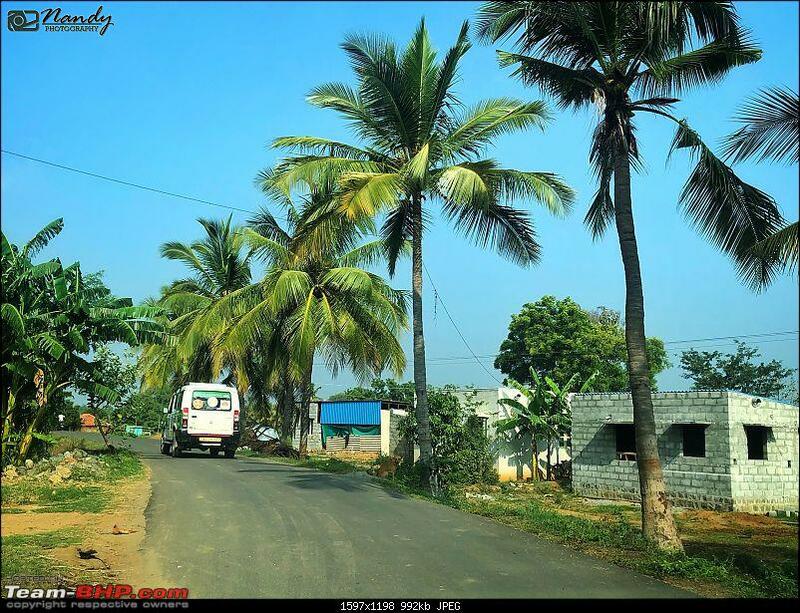 Right after crossing Saisangeet, taking the u turn, and coming back to the highway, a little ahead we took a diversion right after A2B Thoppur, inside a village road and continued driving in order to get rid of the pilling traffic. 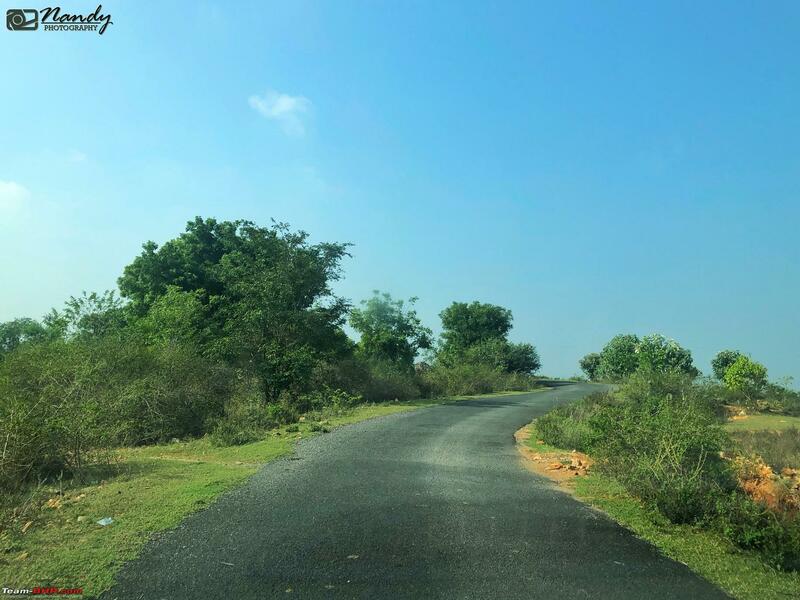 Luckily the road which is known as the Dharmapur-Jarugu-Hogenekkal Road, was in good condition, narrow though, mostly crossing villages, crop and flower fields, a bit on a hilly ranges and only some part of the road in bad bumpy, patchy condition. There were few cars along with us which means we were in the right direction and would reach highway in sometime. 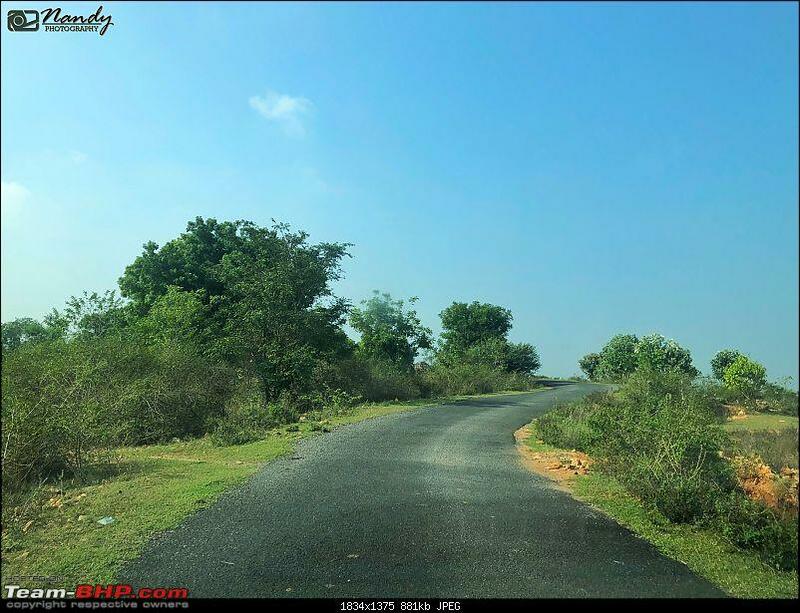 The road we took exited right in the middle of Dharmapuri ghat section (somewhere at a place called Maniathahalli) in NH44 where one side of the highway was jammed packed with vehicles from both side. Though the highway was open on the other side but after a while the traffic merged into a single lane causing long queue of jam. We got caught in between large trucks, but having no other way out we had to patiently keep moving ahead. 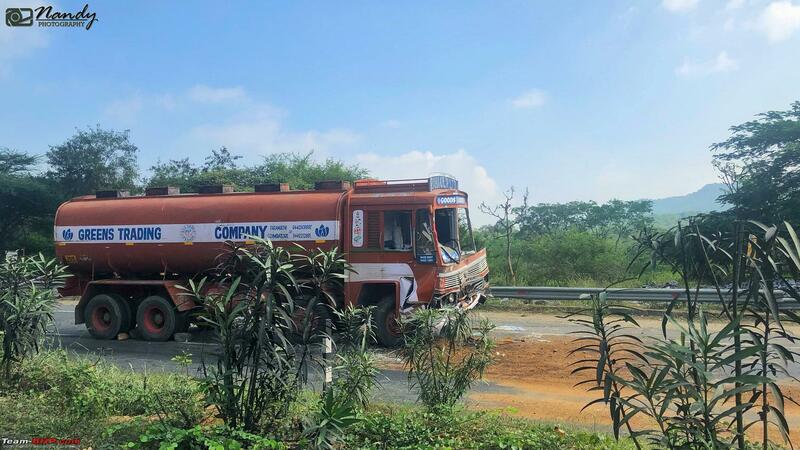 Driving for a while, we could see the ill-fated tanker being parked on the side way and workers were filling in sand on the highway which would let the oil get absorbed. 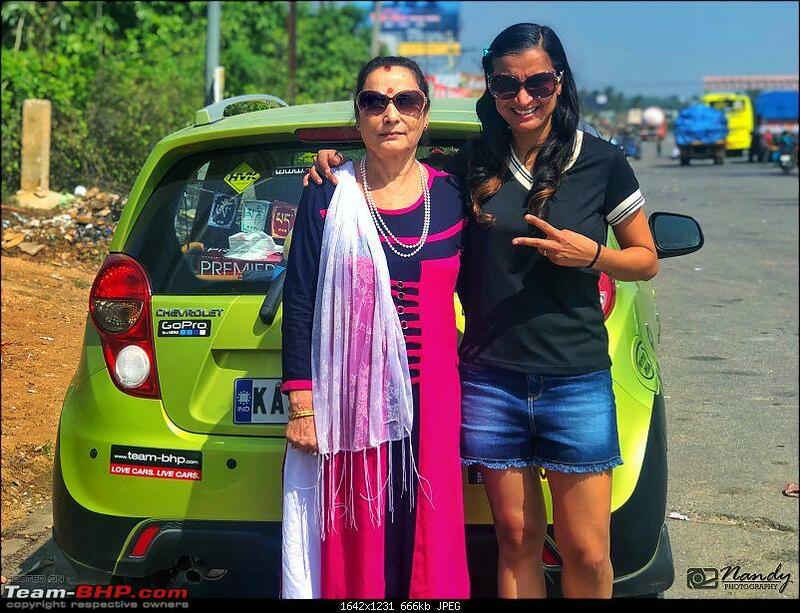 There were other break-downs too, not sure if they were related, but somehow slowly at snail’s pace, we managed to get only some 2-3kms of traffic, just 20mins delay and after that the highway once again opened up. 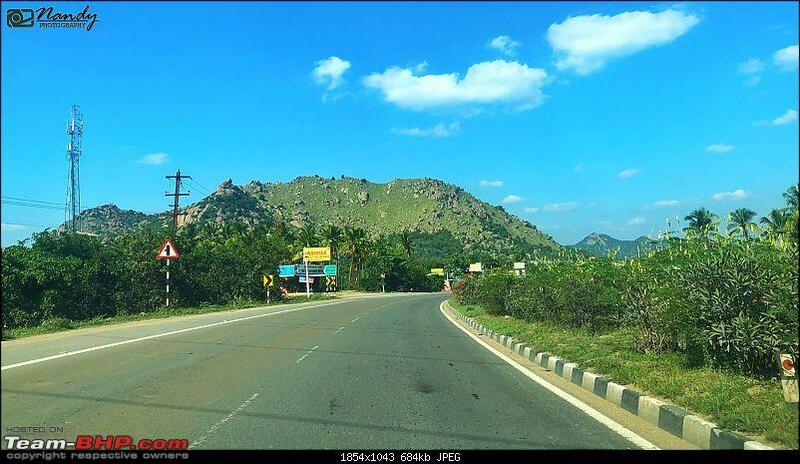 By 10:45am we crossed Salem town and took the clover leaf flyover to exit towards Coimbatore highway. From here on once again I took the wheel, and the drive was quite un-eventful, luckily. It was all about driving on this never-ending boring highway, with not much scenic landscape to offer. We kept driving and crossing towns, had to be extremely careful as the highway is full of cross road openings and many junctions. 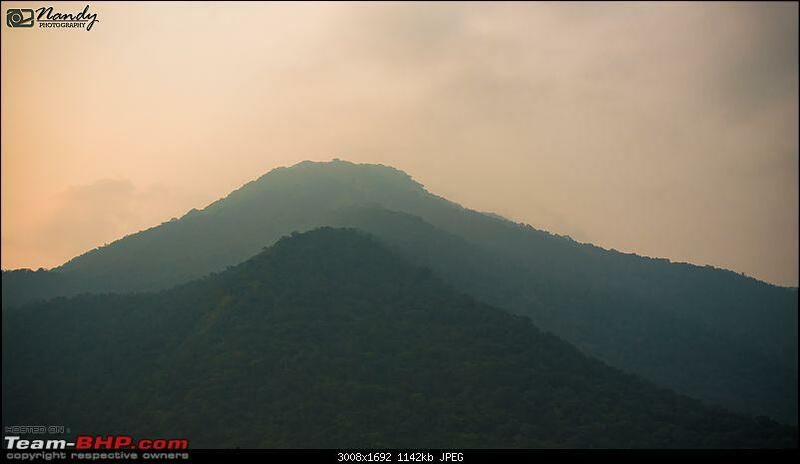 The weather was sultry too, even the AC seems to be not helping in keep us cool. 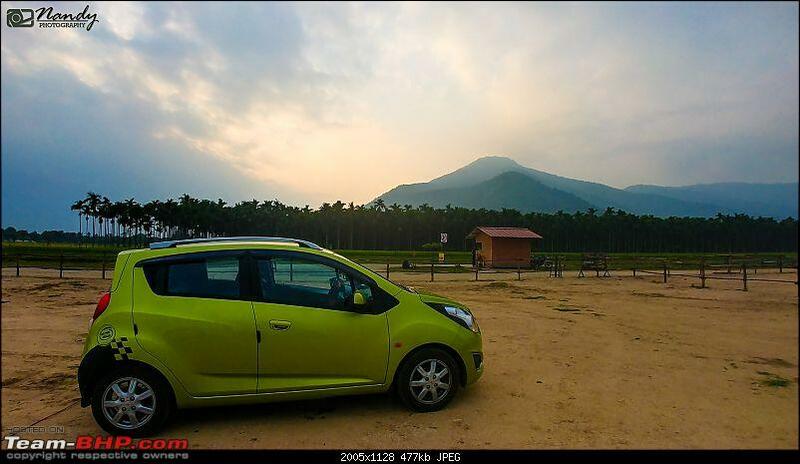 Having lost sufficient time at Thoppur, we didn’t want to unnecessarily take breaks and decided to reach Coimbatore well before lunch time. 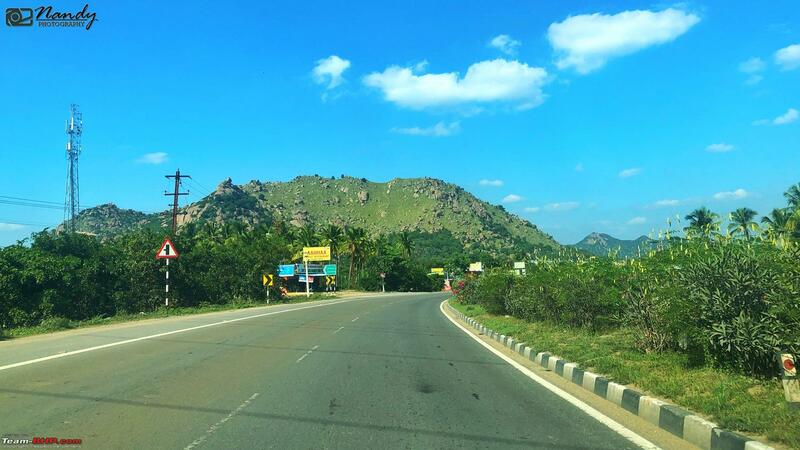 Around 1pm we reached Coimbatore city limits and from here Atul started the drive until we reached our stay. City traffic was quite maddening, with roads being too narrow and vehicles plying from all directions (though people obeyed traffic signals, somehow we felt that the traffic scene was too chaotic). Once again we fell prey to Google Maps’ smartness and its obsession to take shortcuts. 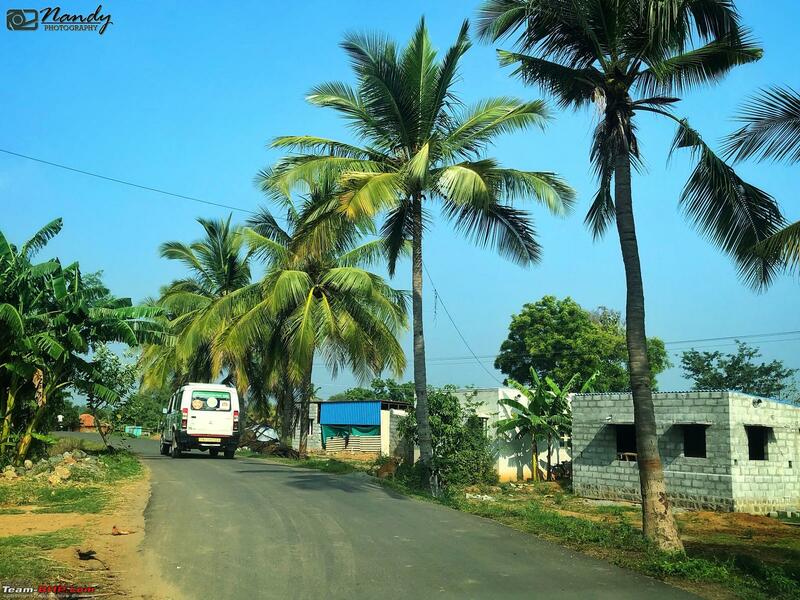 We could have reached our hotel just by following the main road, however, as per G Maps suggestion we took some interior residential road, highly narrow streets and hardly any space for a car to go through. 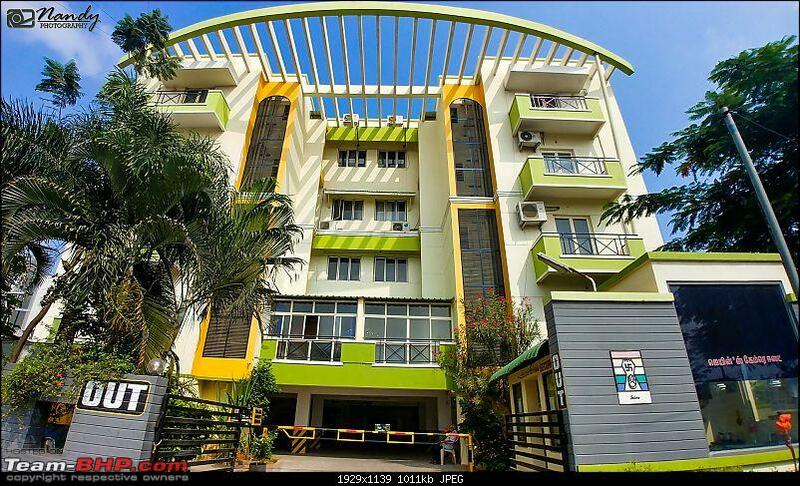 Nonetheless, by 1:30pm we reached our stay, Ulo Illas Domain apartments, bang on the main Avinashi road highway. 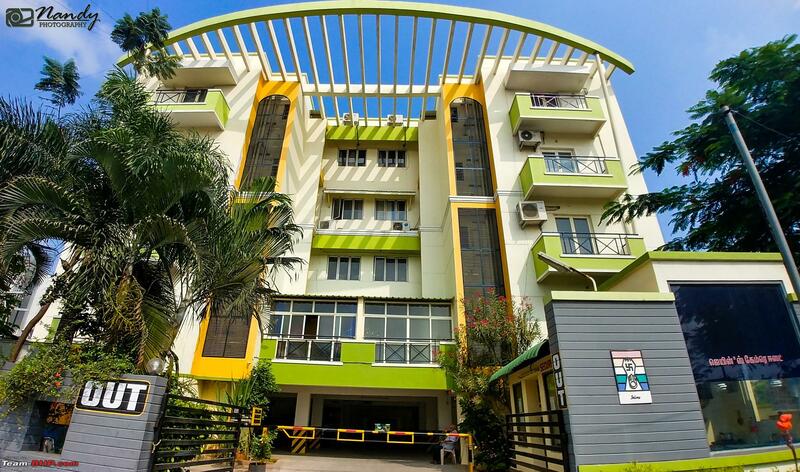 This is a service apartment with provision for hotel rooms, office space and residential flats. Well-maintained, gated community and ample space for parking we had booked a deluxe AC room for 3 adults at a cost of Rs 1560 including breakfast. Looked like it was a fair deal and all eateries, restaurants, etc. were in walkable distance. 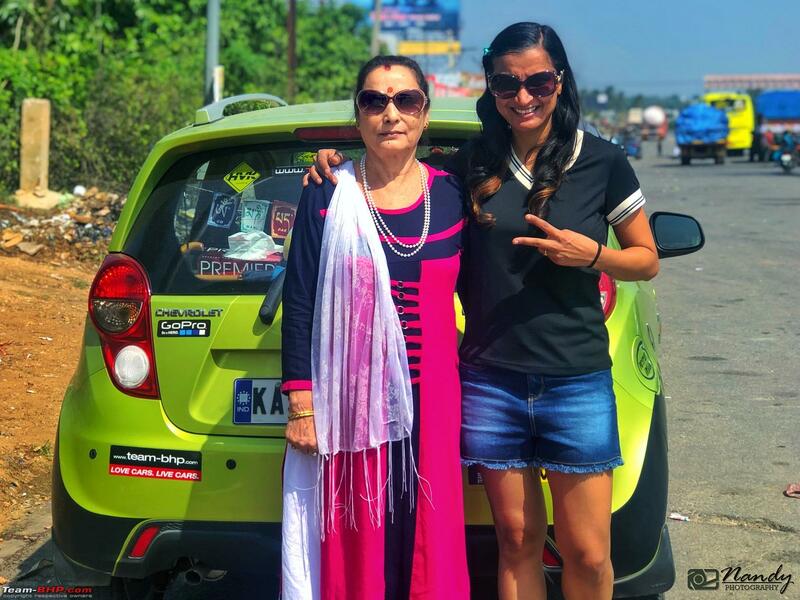 We had to wait for a while as the supervisor of the flat was out for lunch, once he came, Atul finished all the hotel check in formalities, while Mom and I unloaded the bags from the car. We got the keys for our room, which was on the 4th floor of the apartment, and had a view of the city road. Took some rest, settled down, freshened up and since all three of us were totally hungry, we came down to have our food at 2:30pm. 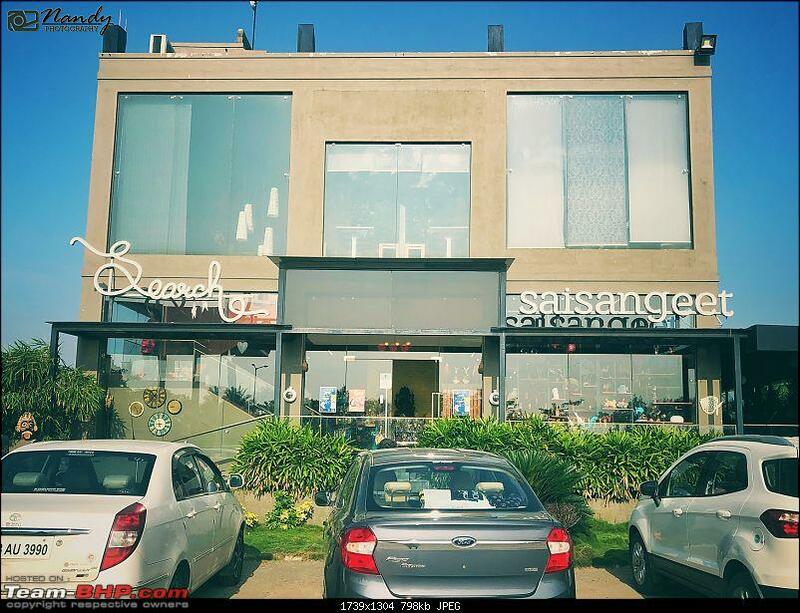 The restaurant right beside our stay, SMS Hotels looked decent and serving both veg and non-veg food. 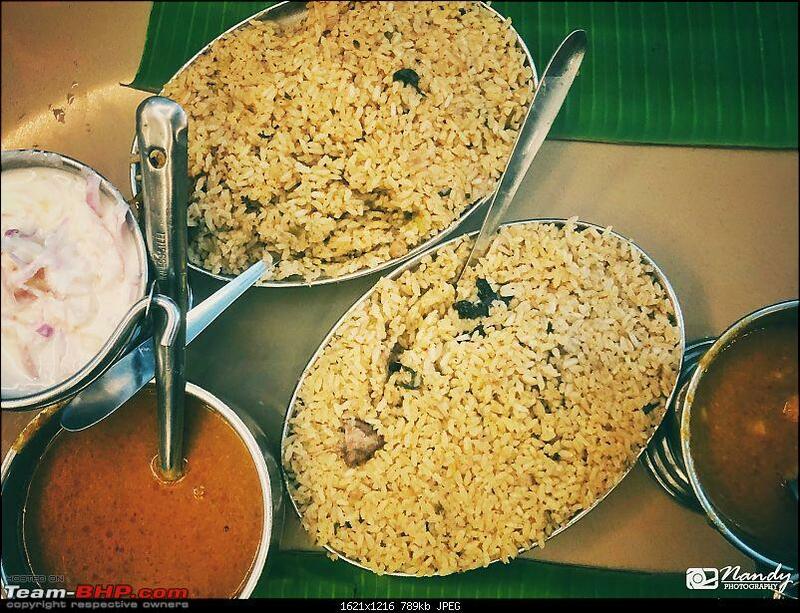 Got our table, ordered food – chicken biriyani, mutton biriyani and veg biriyani for Mom. Food came in real quick and we all started to eat without much delay. To pamper us, we also ordered a fully loaded falooda shake to end the meal. 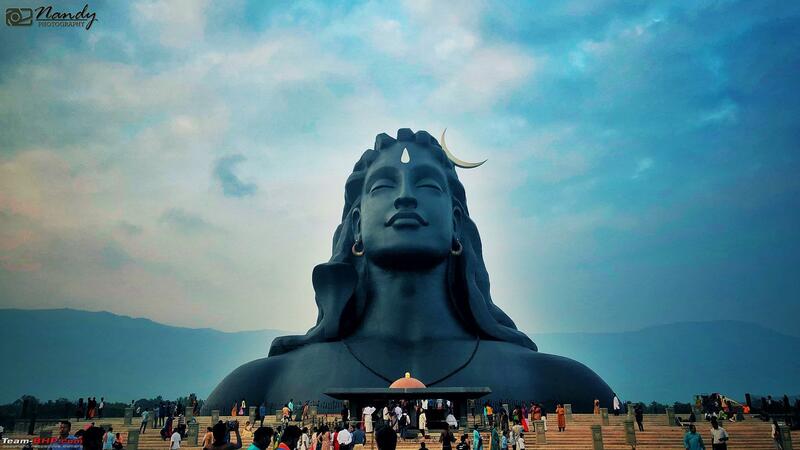 Meanwhile, Atul did some Google search on the exact location of the Adiyogi statue, says 37kms away from the stay. Wanting to visit the place in the daylight itself, we hurried back to our room, changed our clothes, took some rest, and around 4pm headed out. Reaching the place was not difficult at all, however, the roads were full of traffic, vehicles with occasional potholes and people coming in from all directions, it looked like a busy Saturday evening time. By 5pm we reached the parking lot of the premise, paid a parking fee of Rs 30. The main gate sporting the foundation signage of Isha Foundation, a concrete road leads you to the parking space, well spread out. 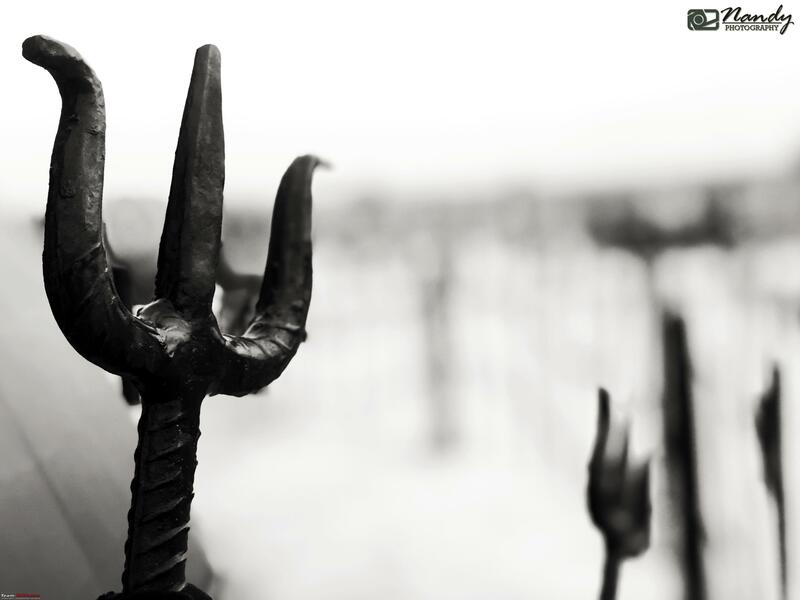 From a distance one can see the majestic view of the Lord Shiva statue and trust me the moment you see the statue, your heart and soul can experience a divine power within, slowly attracted towards it. 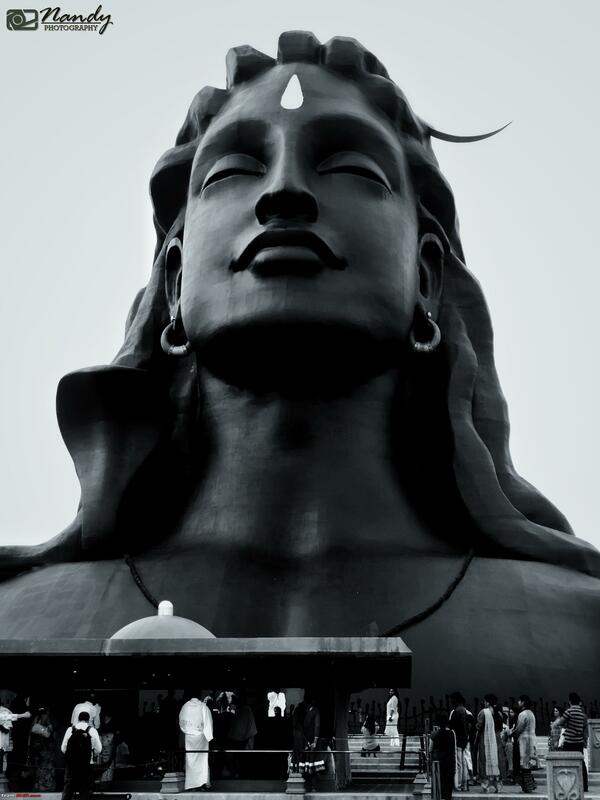 I have never seen something so surreal like this, as if Lord Shiva is sitting just right in front of me, meditating. We parked Skiddy, took our GoPro, cameras and started walking closer to the statue. 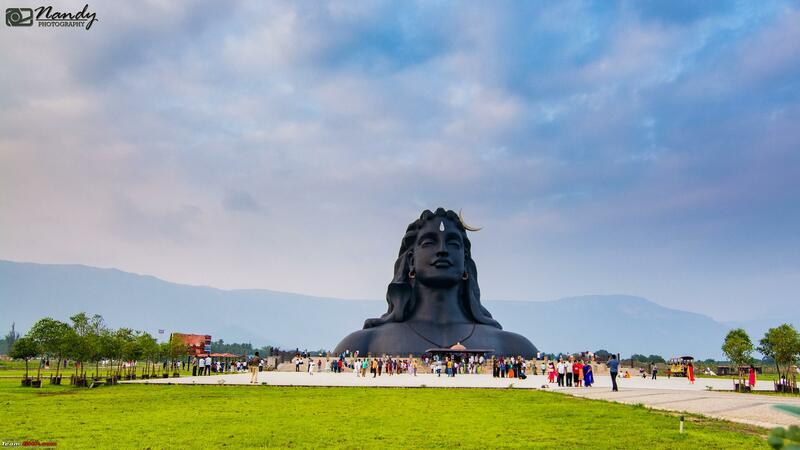 The Adiyogi statue is 45 mts tall and 8 mts wide, being recognized in the Guinness Book of World Records as the ‘largest bust sculpture’ in the world. 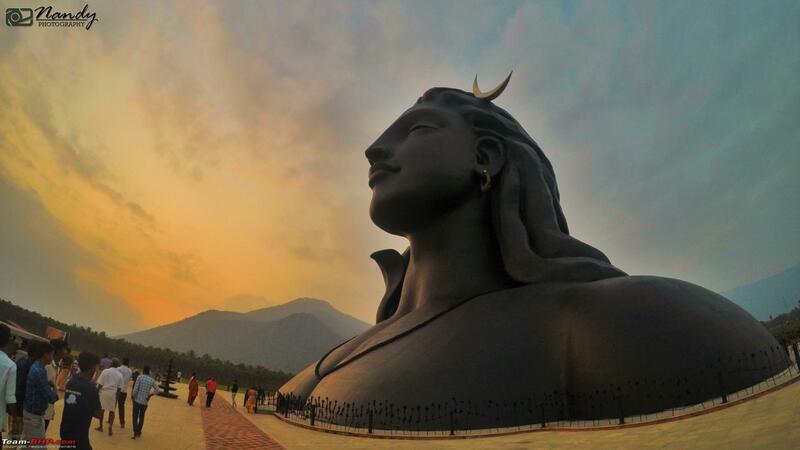 Apparently, this was designed by Sadhguru Jaggi Vasudev, founder of Isha Foundation, for inspiring and promoting yoga. 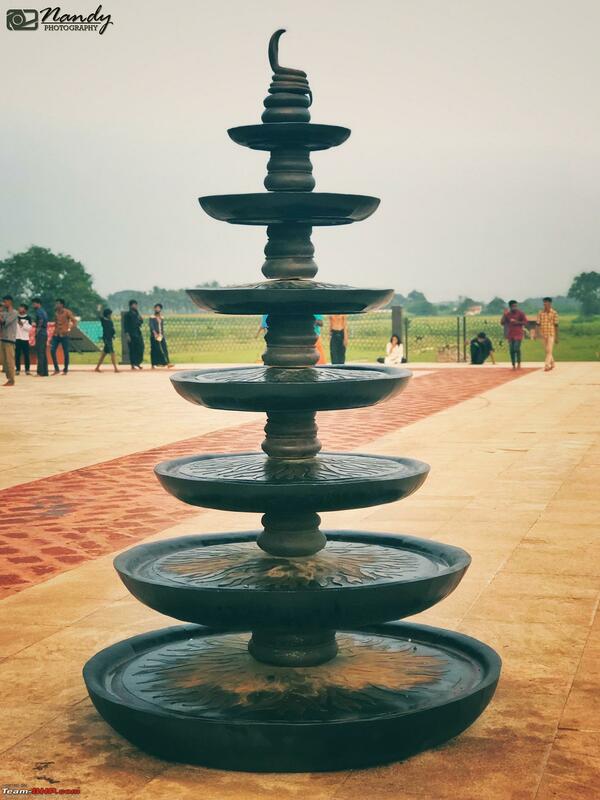 There is also a Dhyanalinga Temple, for people to mediate and understand the feeling of inner immense energy. 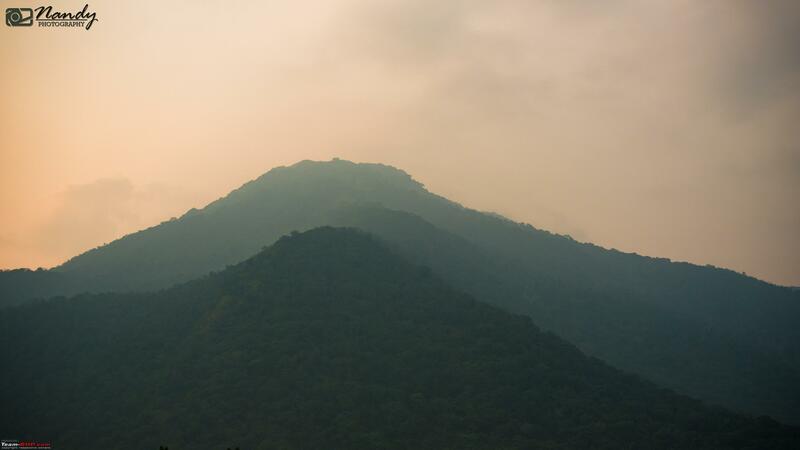 Simply sitting at this place that allows one to reach an elevated state of consciousness and know yoga as an inner experience beyond mere knowledge, philosophy, or technique, beyond race, religion, or culture to bring fulfillment and wellbeing to all is the prime aim of this establishment. 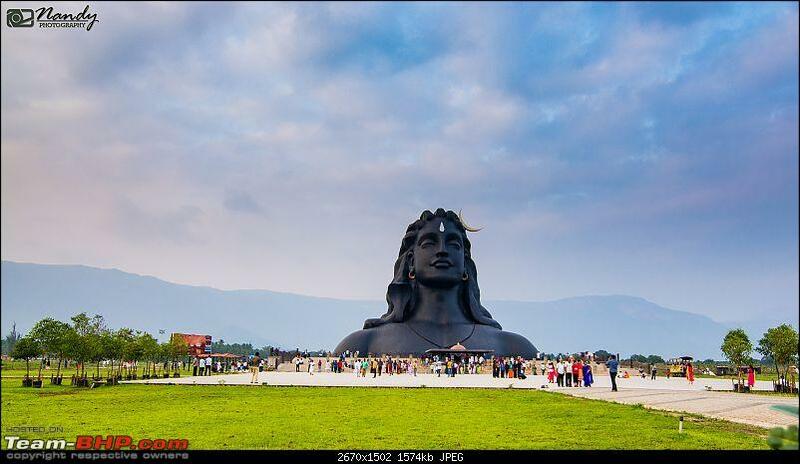 The entire statue is surrounded by distance hill ranges, well spread green trees, open meadows and an ashram for devotees to stay for vacation. 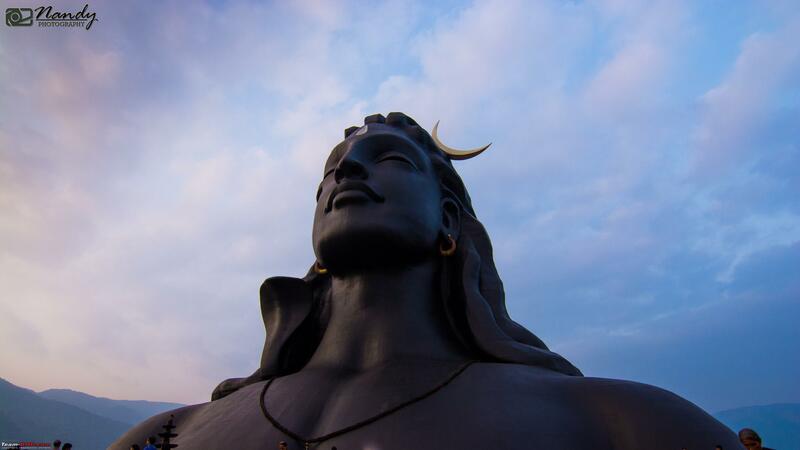 One look at Shiva’s face and you can’t look away, his semi-closed eyes draw you into something deeper within yourself. The serenity and beauty of that face is simply breath-taking and takes you to a different level of elevation. Somehow I liked the area, as it was not projected as yet another touristy place, selling merchandise, food items, stuff to draw more crowd, but just pure love for God, meditation, and yoga. We spent time exploring the statue, clicking pictures, sitting and observing the divine power of Lord Shiva, and enjoying the natural beauty. By 6pm when it started to get a bit darker, we decided to head back to our hotel. On our way, we did a quick pit-stop for some tea and snacks as well. 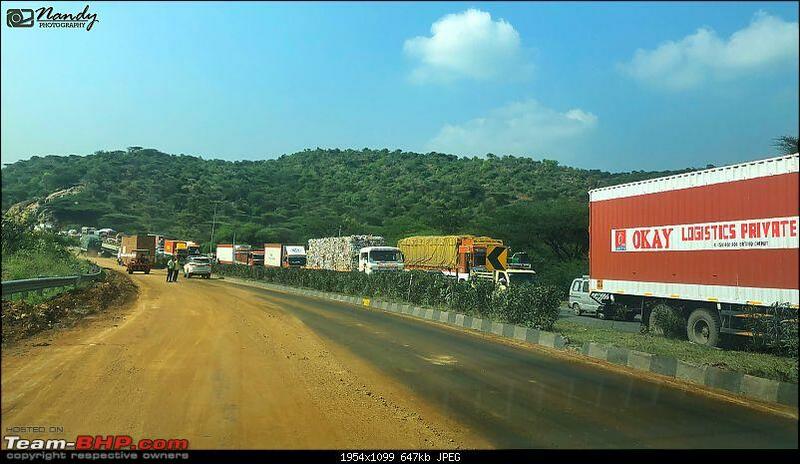 As soon as we entered Coimbatore city limits, the traffic scene became totally worst with dead-lock jams on each road. 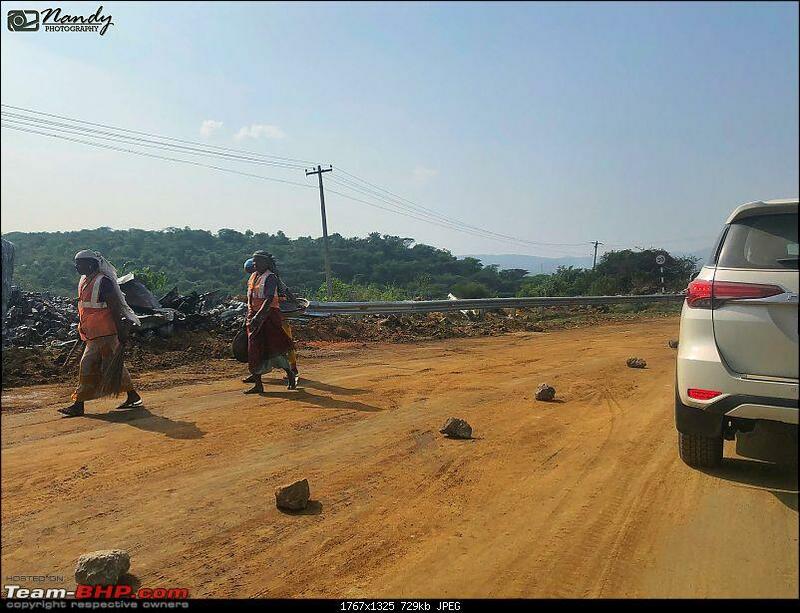 Couple of roads were undergoing construction, which narrowed down the road length even further. 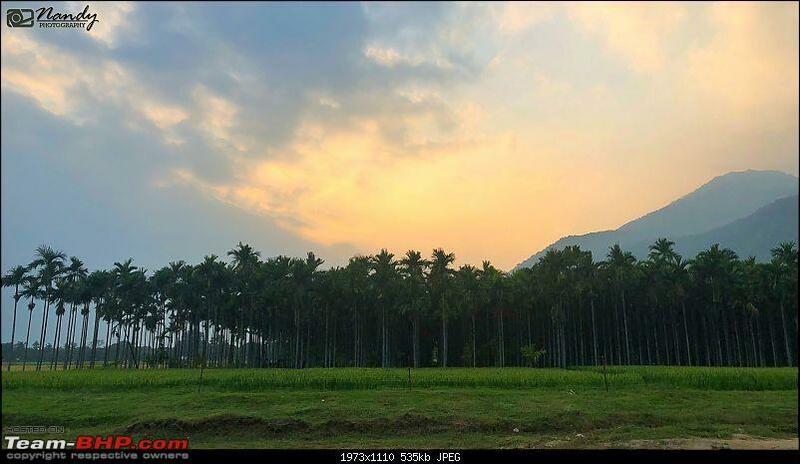 Someone rightly mentioned us that if going would take 1 hour, returning back to Coimbatore would take almost close to 2 hrs. Braving the traffic, we reached our stay at around 8pm. Mom was hungry and hence we decided to have our dinner at some nearby place. 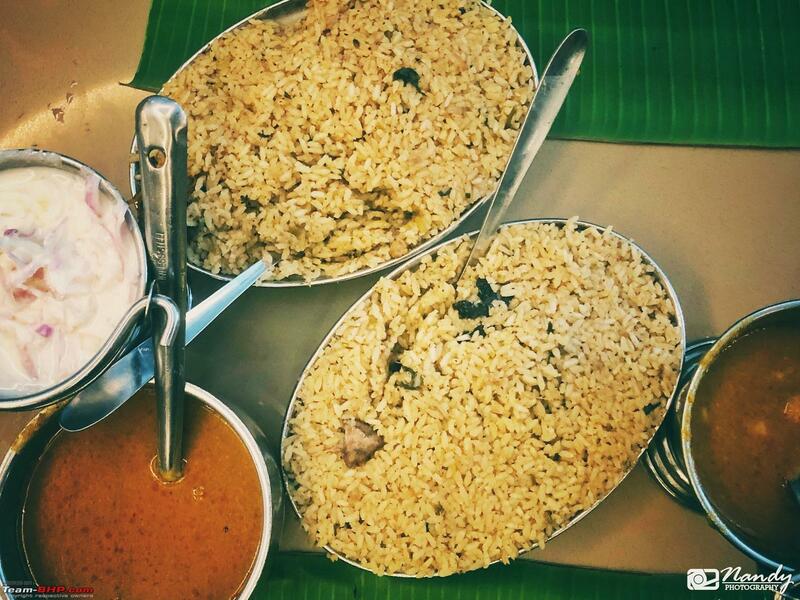 Zomato recommended a nice tandoori and BBQ place, just 2 mins walking distance from our stay called ‘Arunachala’. 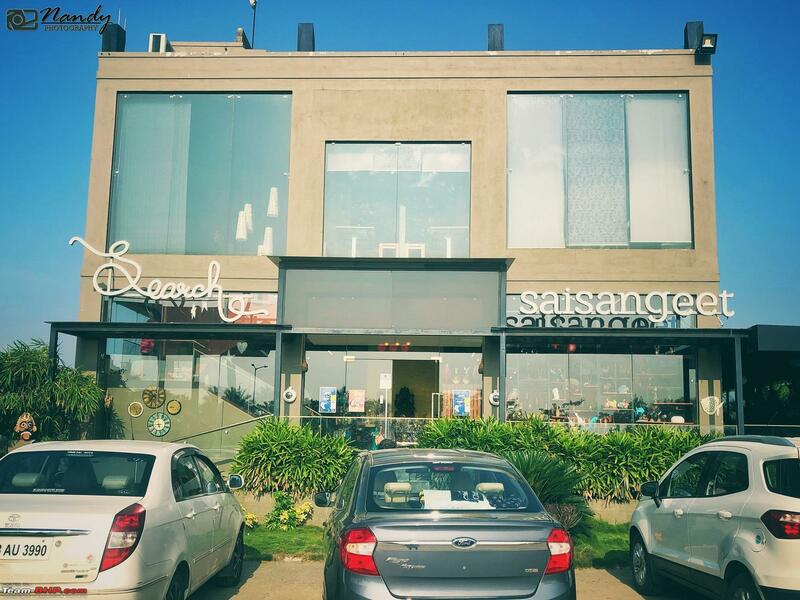 Place was fairly crowded and too many Swiggy guys for picking up deliveries. We got our table, ordered food, tandoori rotis, dal fry and mutton bhunna curry. Food was delicious, with the right mix of flavors and spices. It wasn’t very expensive as well. 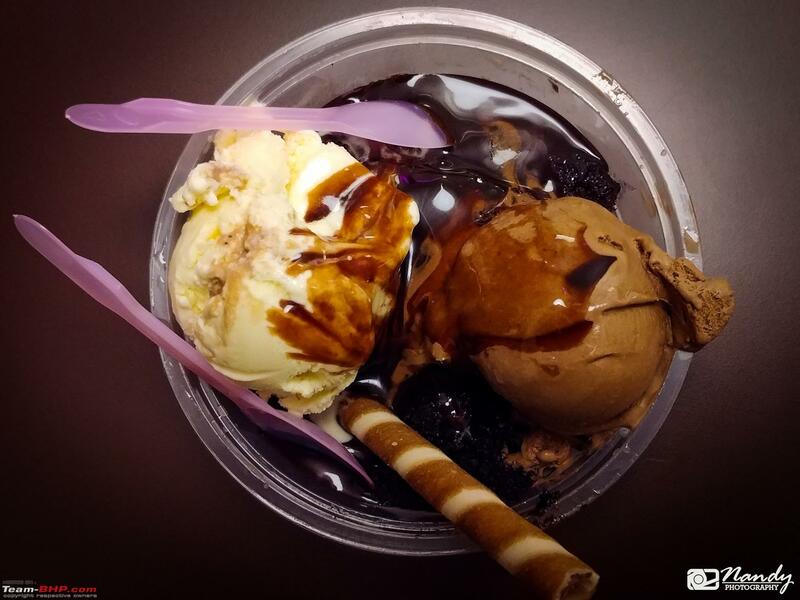 After food, Atul wanted to have some ice cream from the nearby Cream Stone store, he ordered one portion of Death by Chocolate which all three of us shared. It was already 10:30pm by the time we reached our hotel. A tiring yet beautiful day well spent. All three of us freshened up, did some quick packing to reduce hassle in the morning and went to sleep by 11pm. For some reason, all three of us overslept and could manage to get up only around 8:30am in the morning. The care taker gave us a quick knock to let us know that the complimentary breakfast is ready and already kept on the dining table. We freshened up and headed to have breakfast. 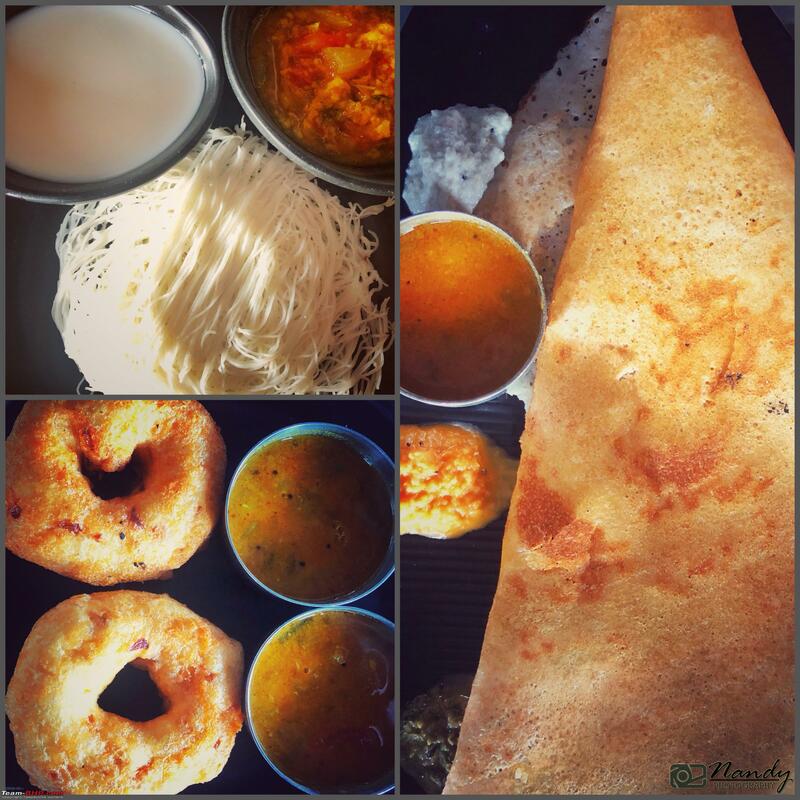 Idly and pongal along with chutney and sambar was there for breakfast along with three cups of hot tea. Post breakfast, we took shower, got ready, did the remaining packing and headed out to leave for home. Atul completed all the checkout formalities with the caretaker and around 10:15am we started our journey. 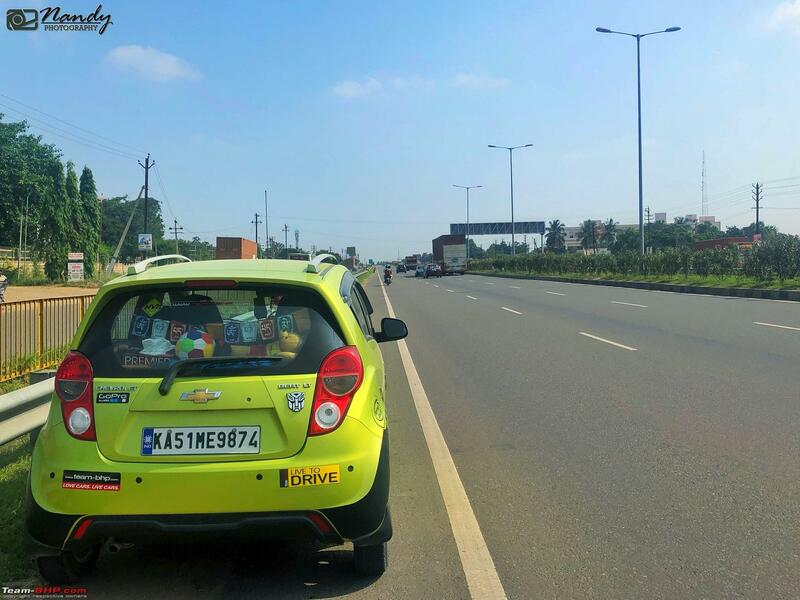 Once again crossing the annoying traffic of Coimbatore was a pain and it took us a hell lot of time to cover the city limits and take diversion towards Avinashi highway. 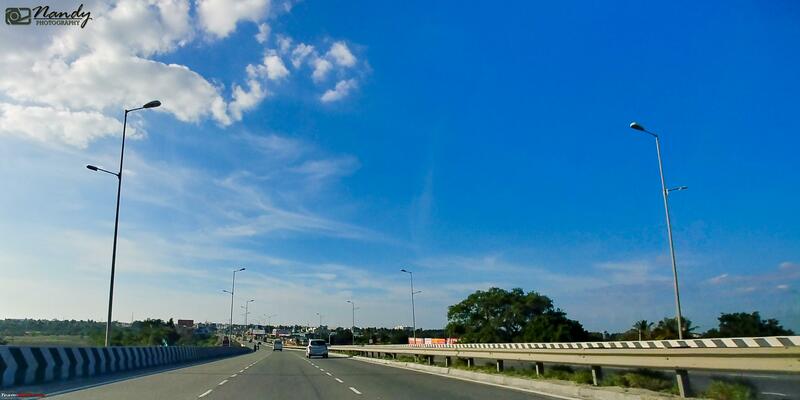 After touching the highway, it was yet another boring highway run amidst extremely hot weather outside. It was only about going on and on and covering distance. 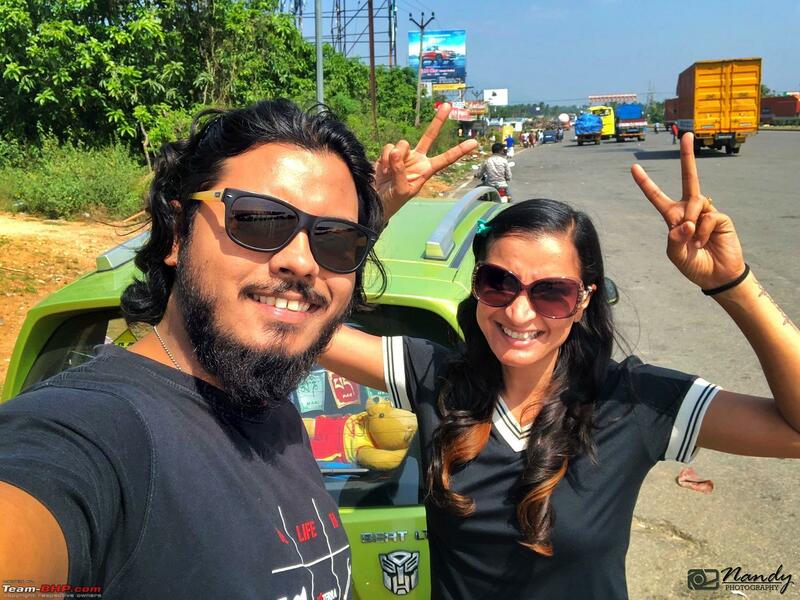 Most sections of the highway, Atul and I kept switching between the wheel, so that none of us get bored and exhausted by the drive. 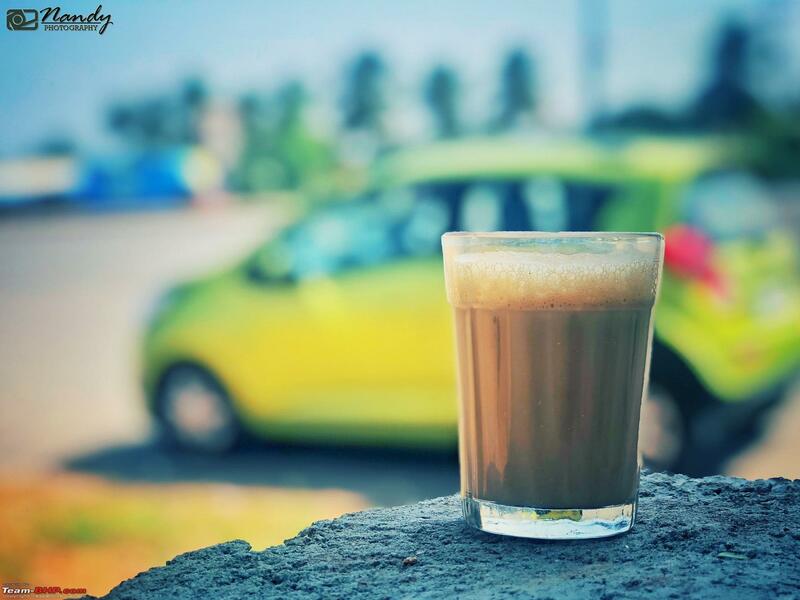 By 12pm we reached a small town called Sankari on the highway, crossed the toll booth and came across a coffee/tea shop, decided to do a small pit-stop here. Ordered three cups of tea and some tea cakes, took some rest, bio break and after some 30mins we once again started with the drive. 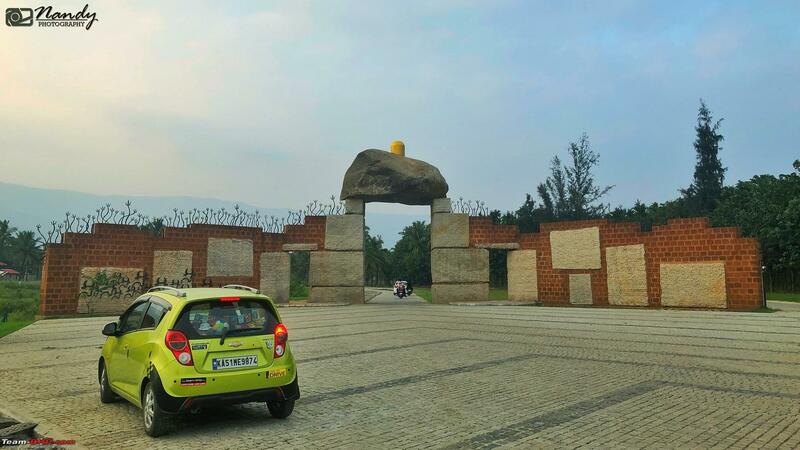 It was almost close to 1:30pm that we crossed the Salem town and took diversion towards Bangalore. I had a thin desire to stop by at Selvi Mess and have our lunch but then the thought of taking a u turn in that busy junction fizzled out the idea and we kept moving ahead. 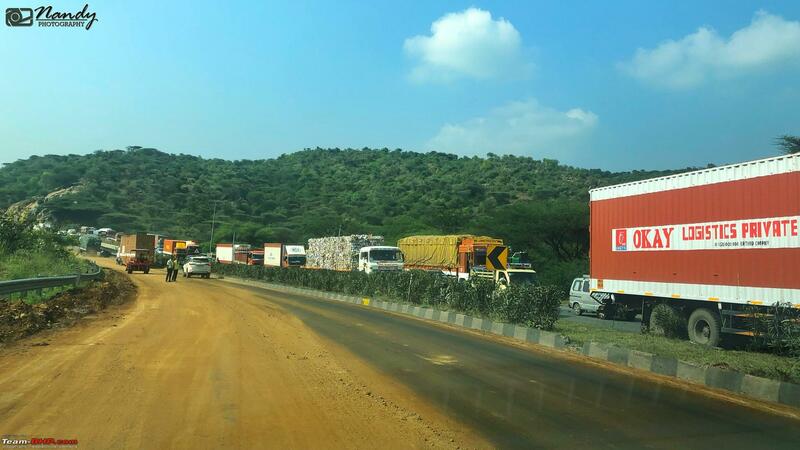 May be it was afternoon time, we didn’t face much truck and heavy vehicle traffic on the highway. Listening to music, chit chatting, crossing toll booth and in no time we realized we are almost about to reach Krishnagiri. We finally decided to have our quick lunch at the Shoolagiri McDonalds. By 3:30pm we were in the parking lot of McD at Shoolagiri. 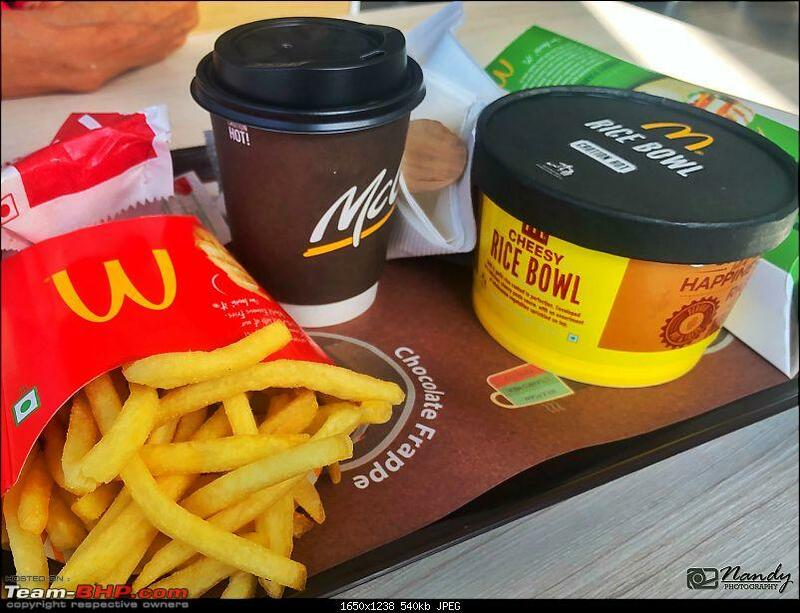 Gave some quick orders of burgers, rice bowl and some coffee. The heat was very uncomfortable and all we wanted to do was finish the food soon and then head out for home. Just before exiting the premise, we tanked up Skiddy in the nearby HP petrol bunk. 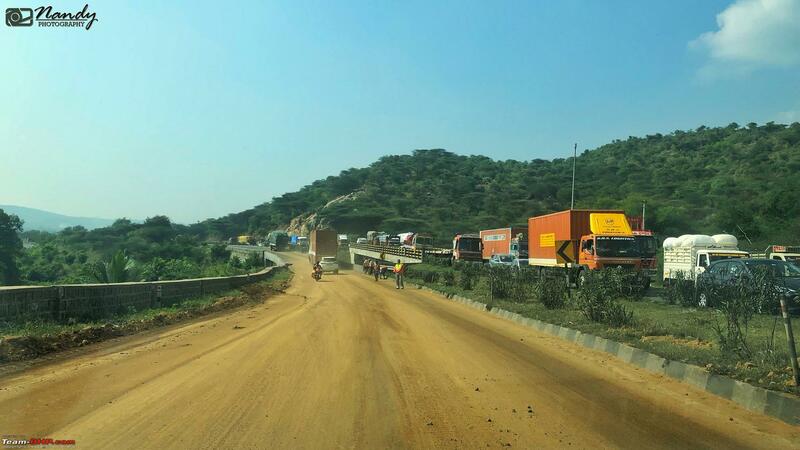 Remaining section of the drive was pretty much usual of entering Karnataka, crossing Attibele toll booth and then taking the elevated expressway to reach Silk Board. 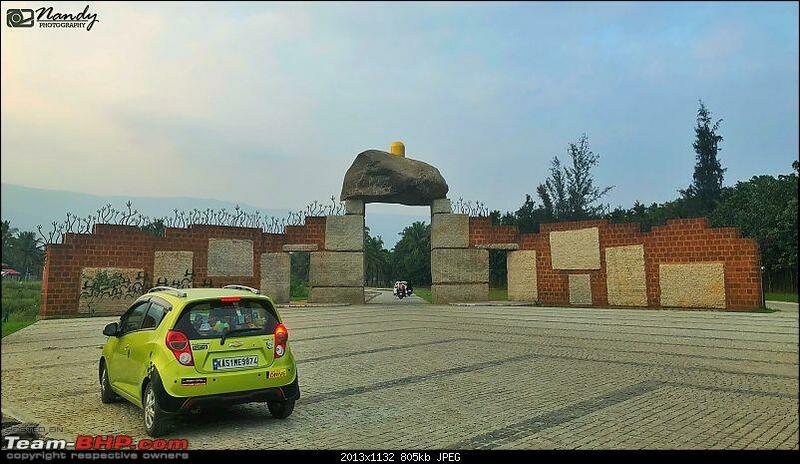 We wasted some time crossing Bannerghatta road, eventually reaching home at around 5:30pm. End of another trip and witnessing something so divine, was really a fresh start to a brand new week ahead and some solace from the Monday Blues! Good write up. 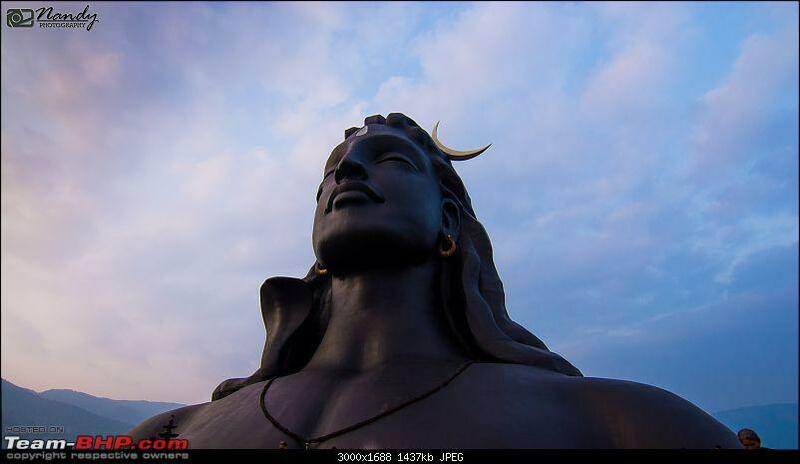 If you plan sufficiently in advance, the Isha foundation has some excellent rooms at various price points. Bookings are through email or web - I'm not sure. They also serve good food too. If one plans to stay overnight, best to book, reach after 1.00 PM, and leave next morning, after breakfast. The code of conduct is strict, AFAIK. I'm not related to the foundation, though. And have not been there. Last edited by BaCkSeAtDrIVeR : 5th December 2018 at 00:28. Beautiful pictures, as usual, Nadita! Thanks for sharing with us. 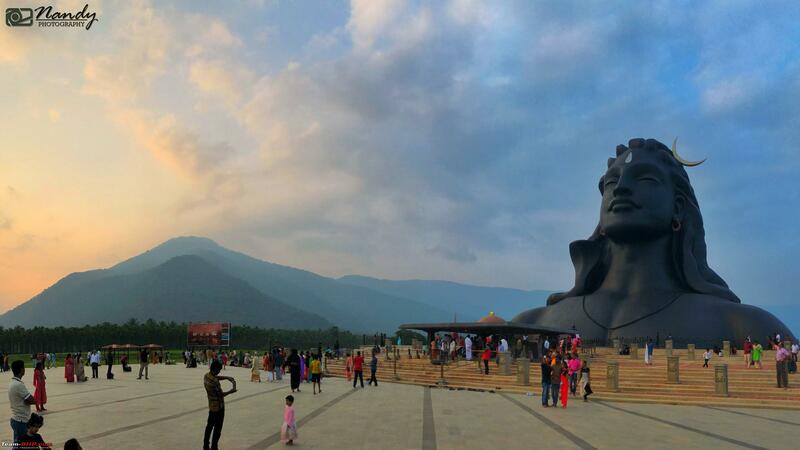 Where exactly in Coimbatore is this statue located? 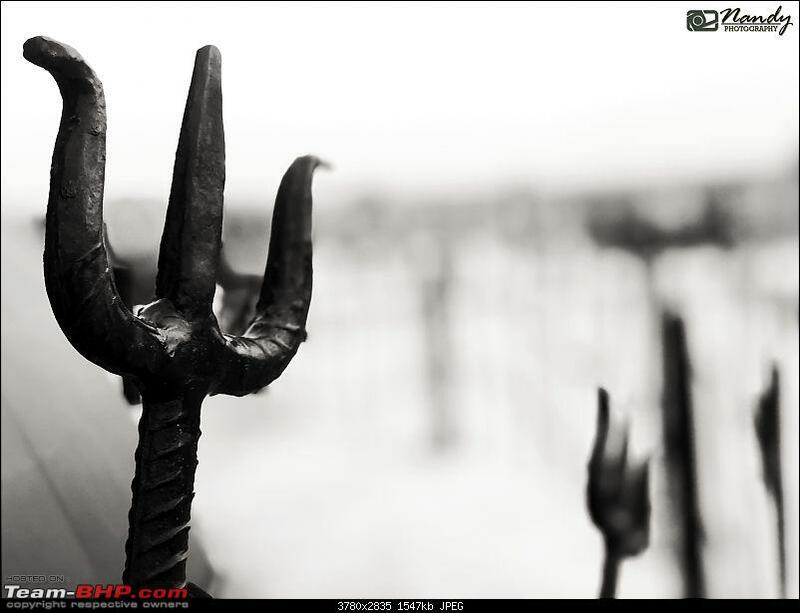 Chaotic traffic and the Avinashi road brought back a lot of memories for me. Lived there for 3 years during my graduation. I used to joke that the traffic sense of Coimbatore was the worst until I reached and experienced traffic here in Ahmedabad. Last edited by R-Six : 5th December 2018 at 12:56. 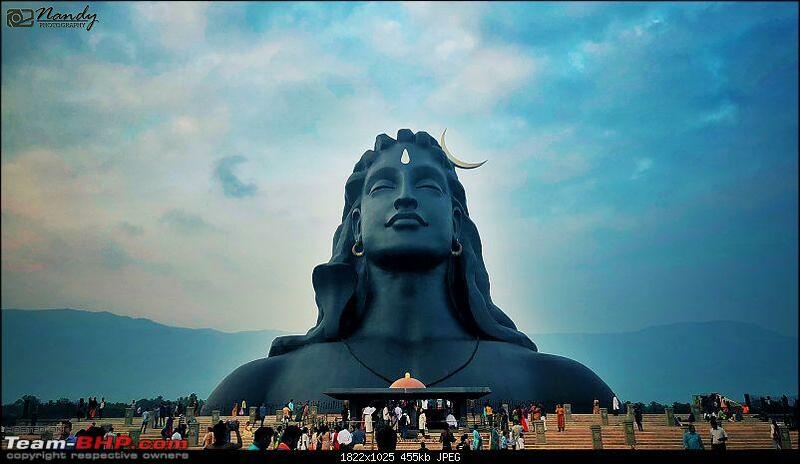 *Note to self - though we travel 2-3 times a year to Palakkad/Coimbatore, haven't found the opportunity yet to visit the Isha Foundation to see the Adiyogi statue. Definitely on the list to visit soon. 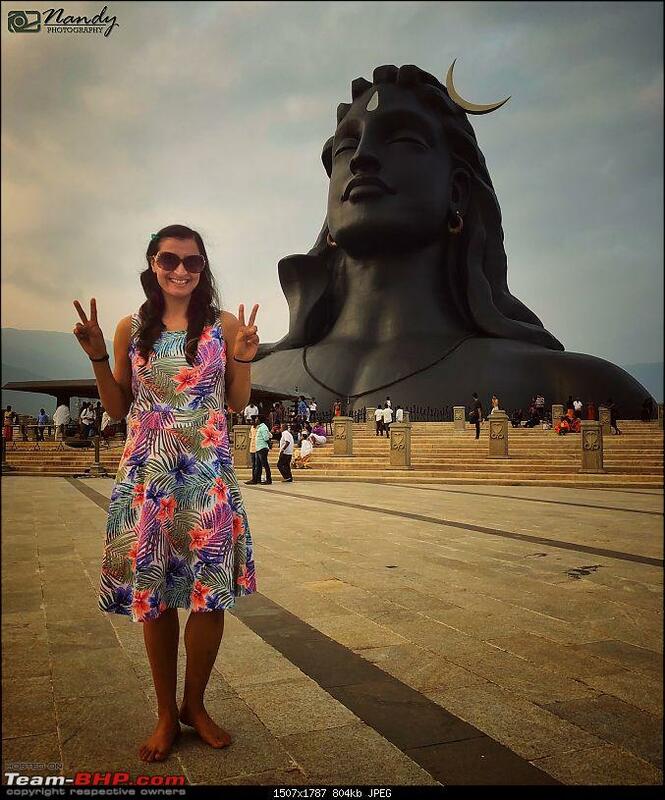 The statue was very different from all the Shiva statues I have seen in the past and instantly I felt the urge of seeing it by my own eyes. Good write up. 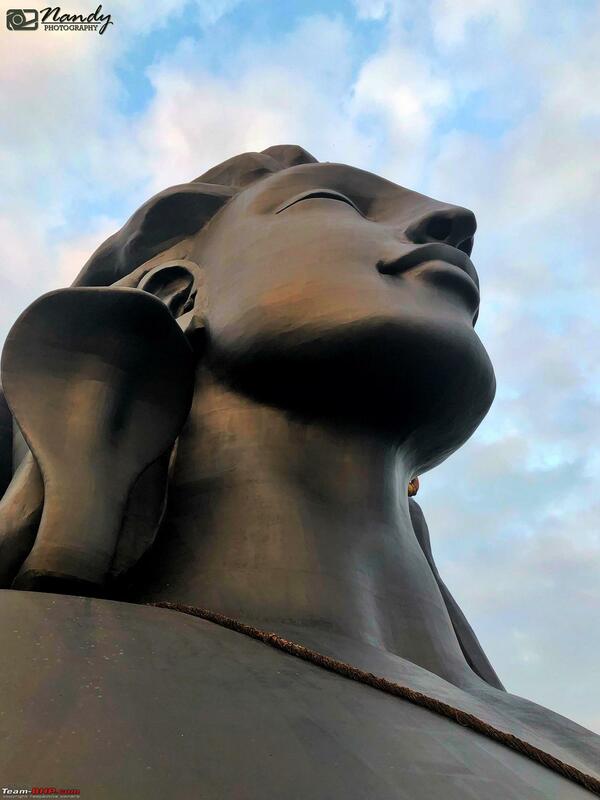 If you plan sufficiently in advance, the Isha foundation has some excellent rooms at various price points. Bookings are through email or web - I'm not sure. WOW! You guys never get tired of exploring. Hats off. My mom and sis would love to visit this place. And next time you cross salem try this place called Managala Vilas, New Bus Stand. I would say better food than Selvi Mess (atleast to me). 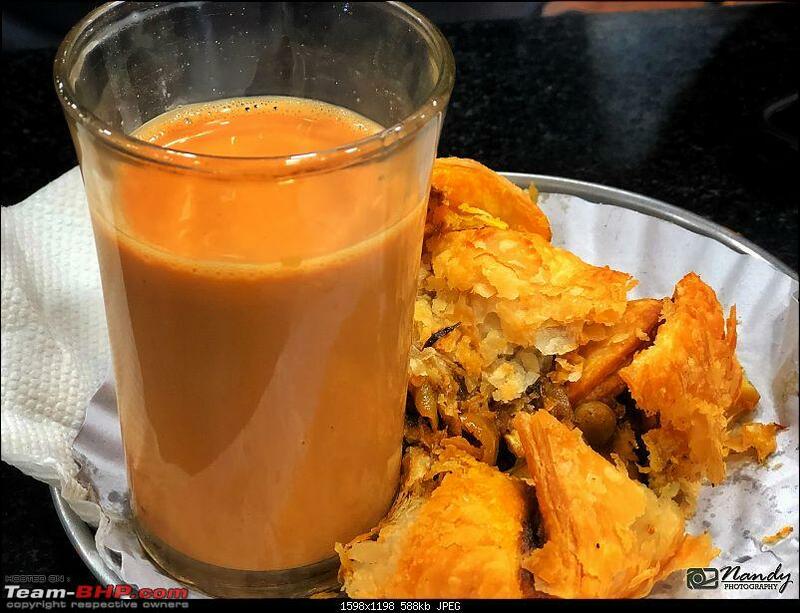 They are very traditional, spicy and oily as well (they use peanut oil which is good). Beautiful pictures, as usual, Nandita! Thanks for sharing with us. 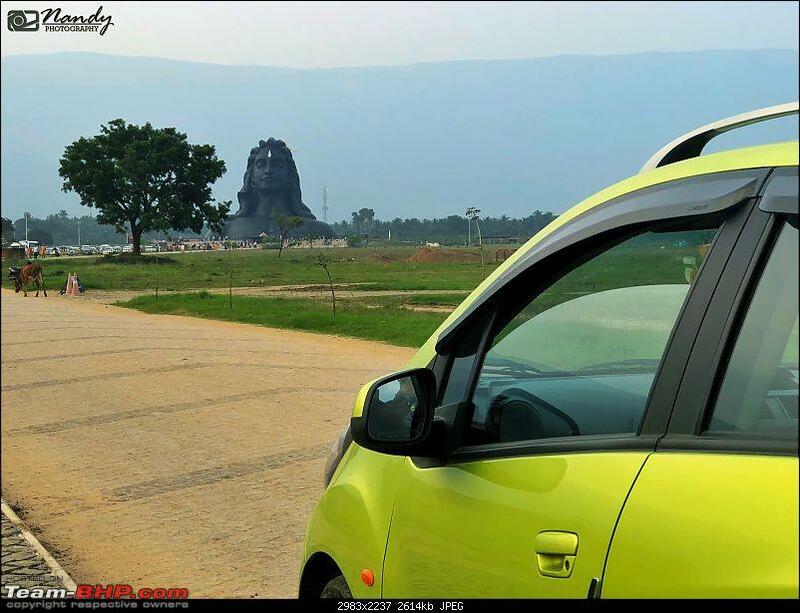 Where exactly in Coimbatore is this statue located? Thanks! 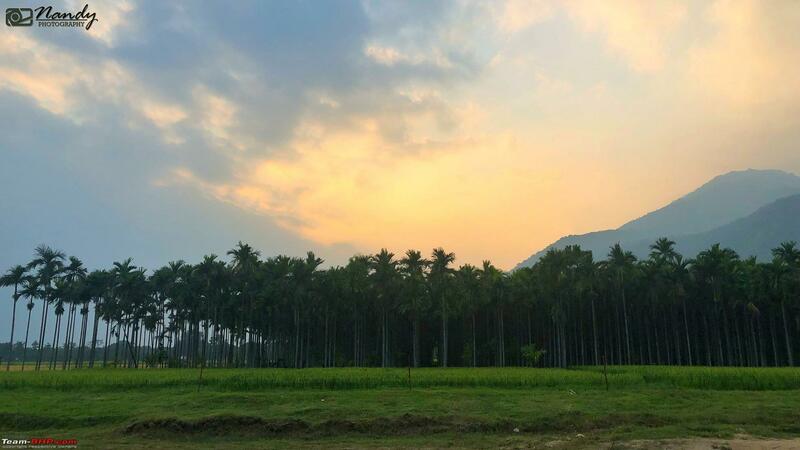 This place is almost 30 kms from Coimbatore, exactly 1 hour from the city and is very easily guided by Google Maps. Thanks for yet another lovely travelogue with detailed narrative of your experience and superb pictures - Definitely on the list to visit soon. Thank you so much and please do visit, I bet you and your family will like it. WOW! You guys never get tired of exploring. Hats off. My mom and sis would love to visit this place. 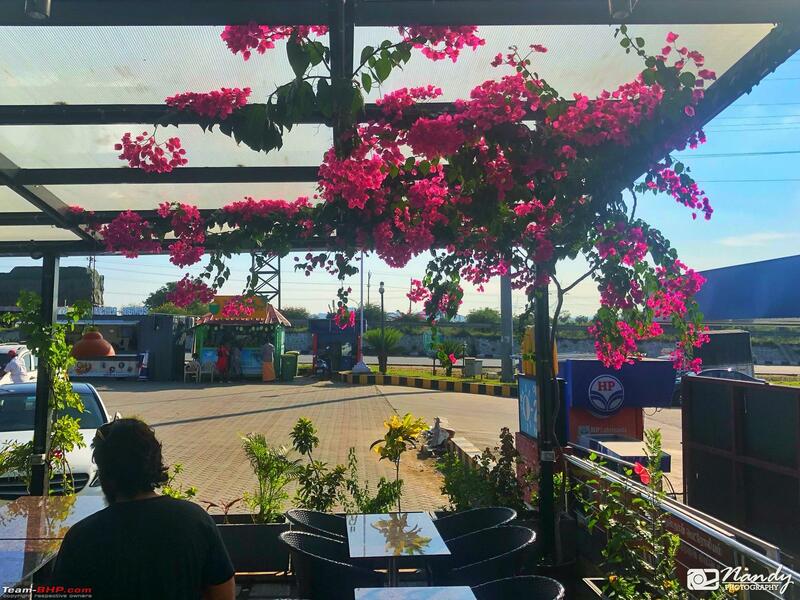 And next time you cross salem try this place called Managala Vilas, New Bus Stand. I would say better food than Selvi Mess (atleast to me). They are very traditional, spicy and oily as well (they use peanut oil which is good). Thank you! This is definitely a must visit place with family over the weekend. Also, would surely try the restaurant you mentioned next time. 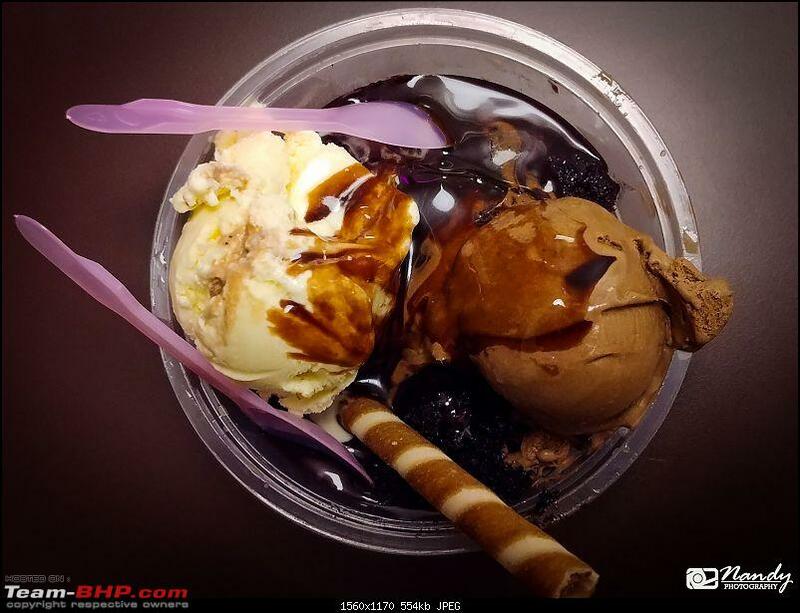 For me personally, Selvi Mess isn't the same as before. Thanks for sharing the video, Atul. 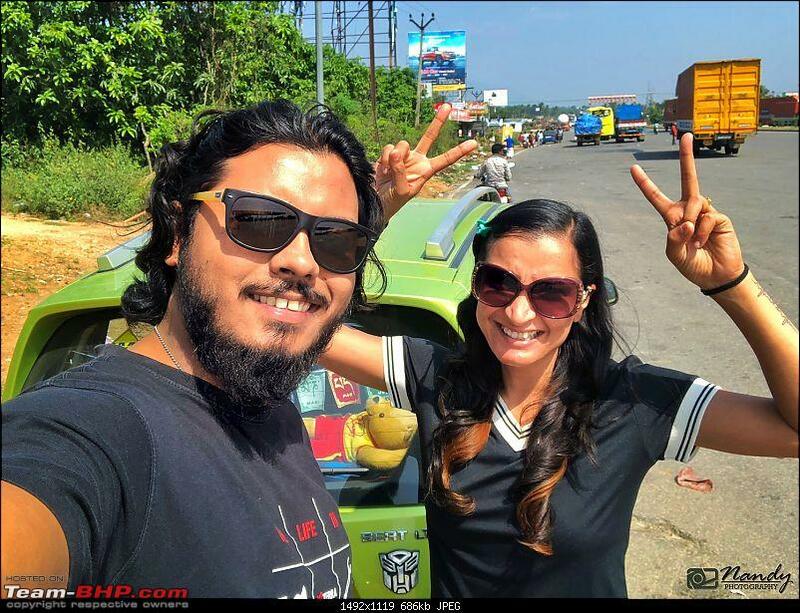 Your travelogue inspired us so much that it was on the to do list and when we did a quick 2 day dash to Palakkad around Christmas in Dec 2018 (just 3 weeks after your travelogue was posted), with our early start from Bangalore, we were on the Coimbatore bypass early, so took a diversion near Madukkarai and visited Isha Foundation. 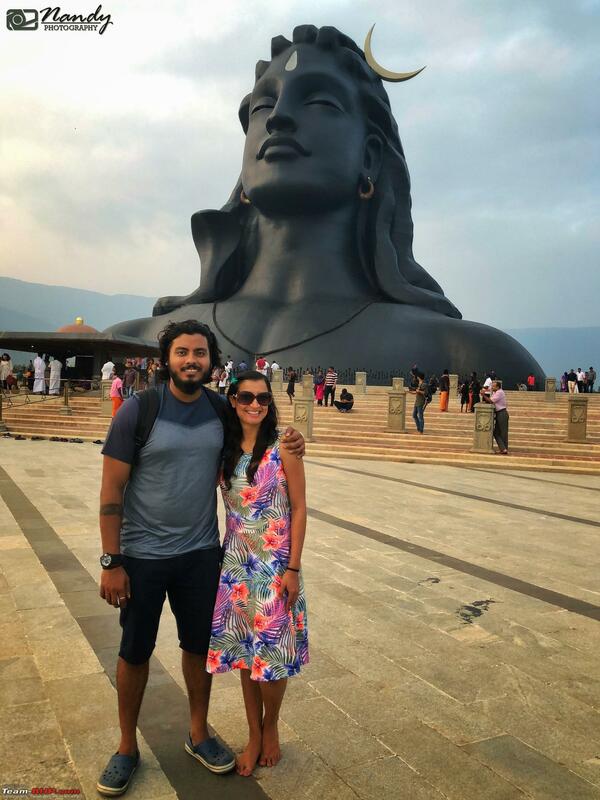 We spent more than an hour at the Adiyogi statue but didn't have more time to visit the Dhyanalinga (meditation centre) and rest of the Ashram premises, will do that some other time. 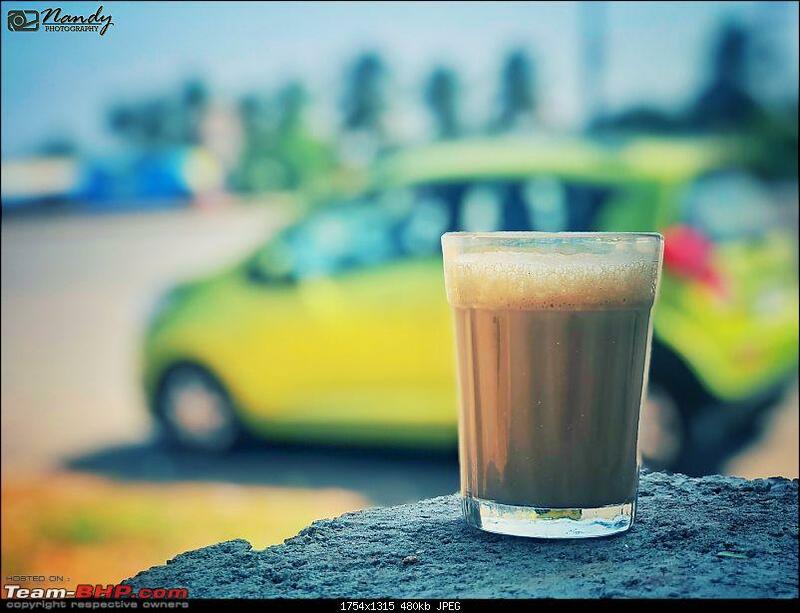 A nice travelogue with great pictures. If any of you guys are planning a visit to the Adiyogi statue, see to that you reach there by morning or evening. 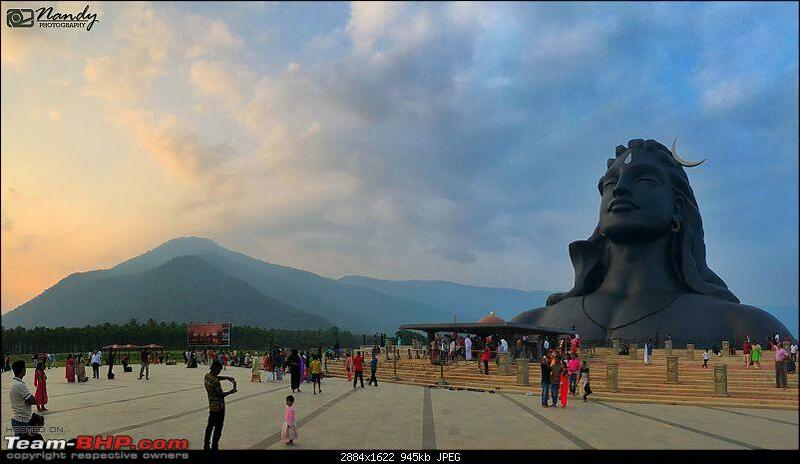 There won't be much shady places around Adiyogi statue and scorching sun might be inconvenient during hot days. 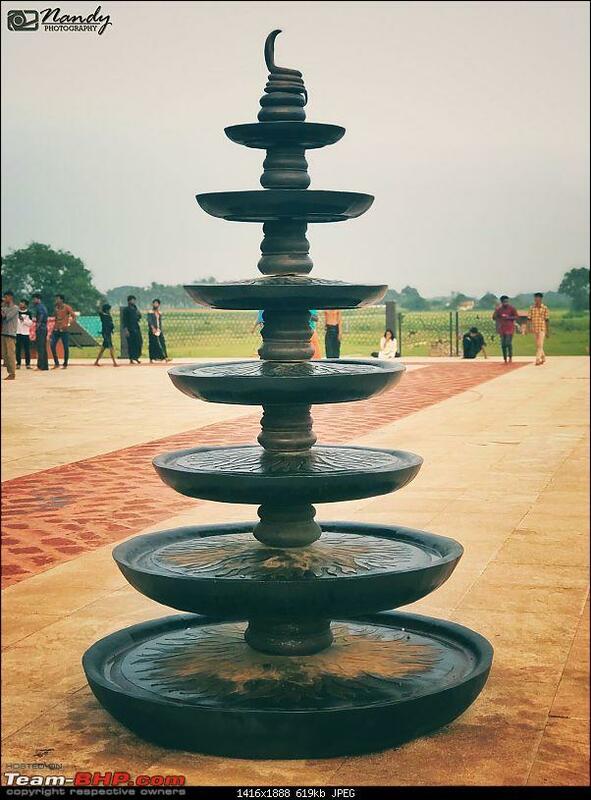 Dhyanalinga is a significant aspect of the yoga centre, don't miss it during your visit. 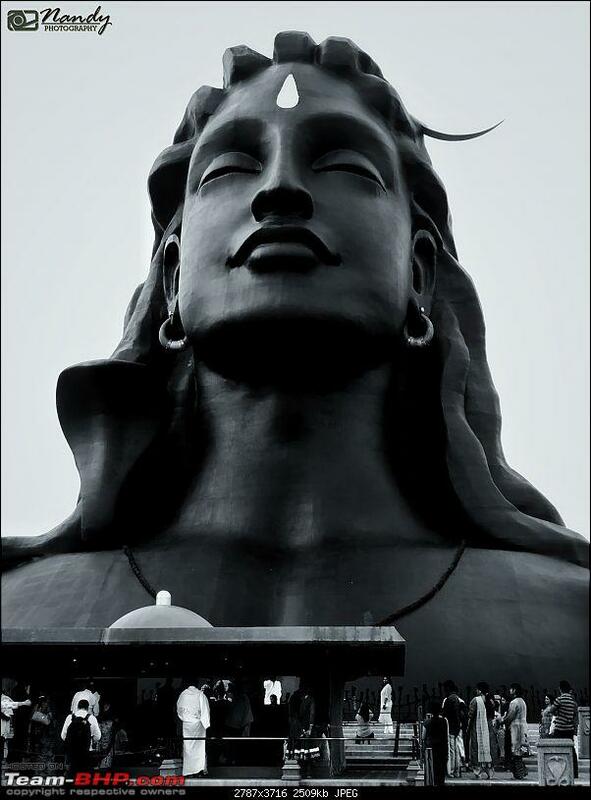 I am an Isha yoga practitioner. For any details needed, I would be delighted to help.